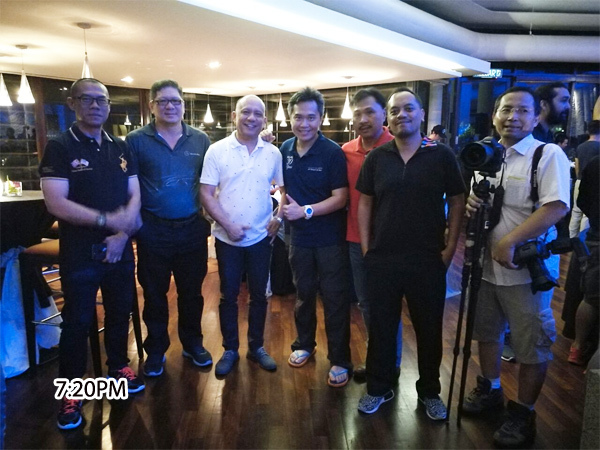 One of the lucky customers of Jati Transport Sdn Bhd was very grateful that the company hosted such event outside of Brunei Darussalam for their customers. 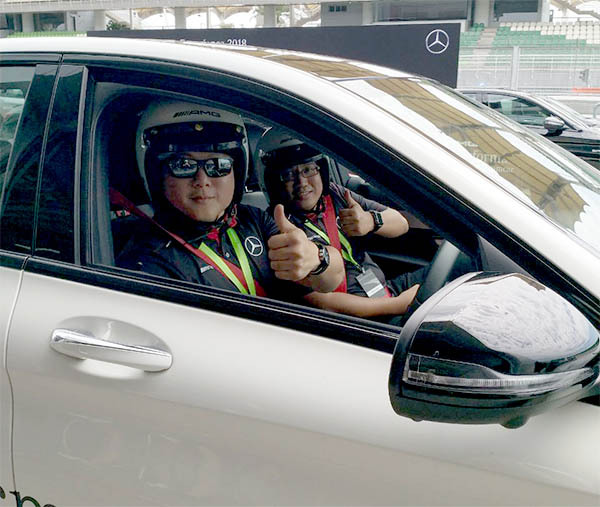 Not just one or two customers but 10 lucky customers had the privilege to test drive different ranges of the Mercedes-Benz models on the famous Sepang International Circuit, Selangor, Malaysia recently. 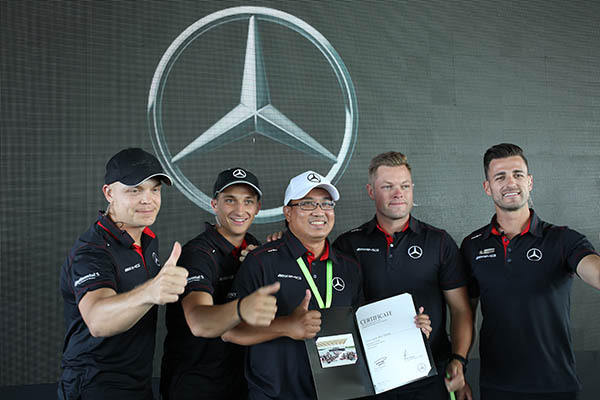 This was also made possible by Mercedes-Benz Malaysia as the winners were able to participate in the Mercedes-Benz Driving Experience 2018 in Kuala Lumpur. 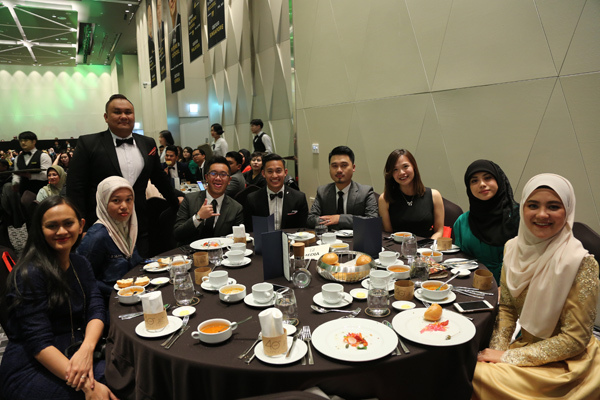 Our Brunei representatives was grouped with the Philippines, Singapore and Bangladesh. 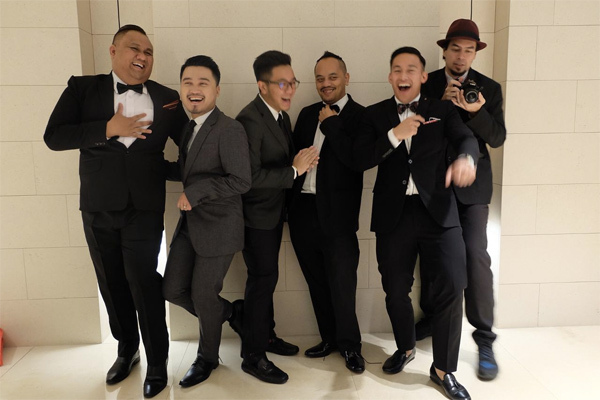 All of us were treated to stay at The Ritz-Carlton Hotel in Kuala Lumpur and it truly fitted the occasion hosted by Mercedes-Benz Malaysia. 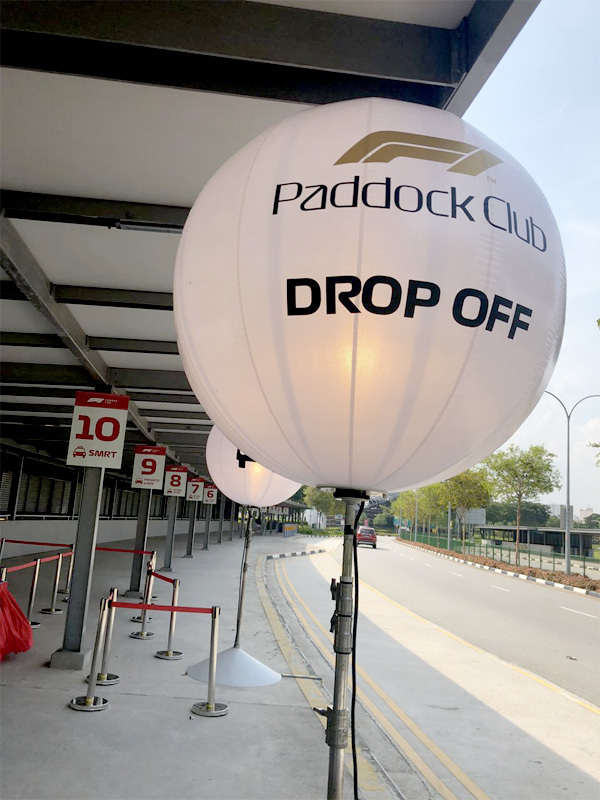 We were treated to a great hospitality team by MBM at the Paddock Club 1, maybe the best I’ve experience at Sepang International Circuit and we were given awesome Mercedes goodies. Let’s not forget the free flow of food and beverage during the whole day session. 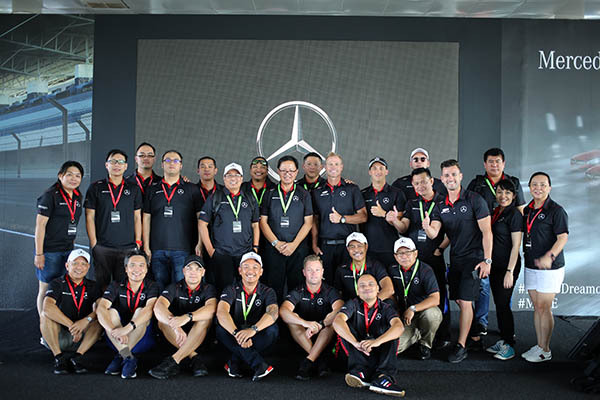 Before experiencing the different rides on the different Mercedes-Benz models, the participants were greeted by Peter Hackett, MBM AMG Representative/Chief Driving Instructor/Australian Endurance Championship GT Race Driver and he gave a run down of the program and also a briefing on certain skills such as braking, wheels and most of important, safety in dangerous situations. So which models did we drive? 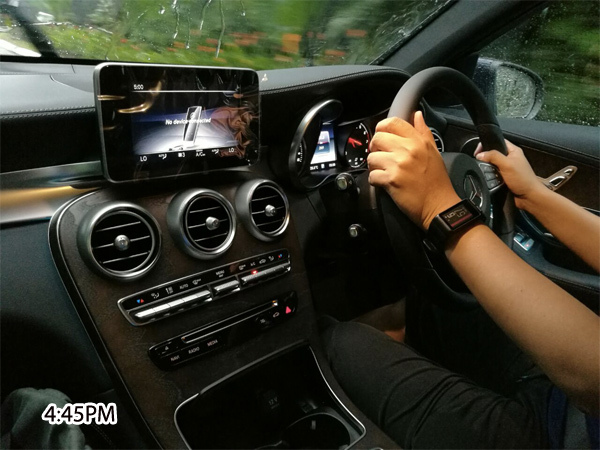 The C300, The A250, The CLS 450 and lastly, my favourite, The AMG C 43. 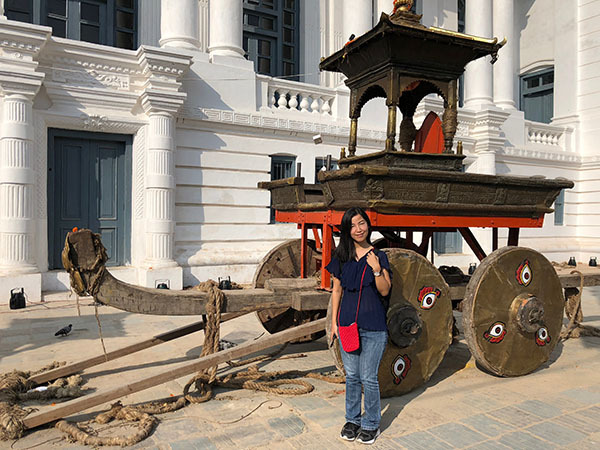 Most of us were able to also drive the GLCs. 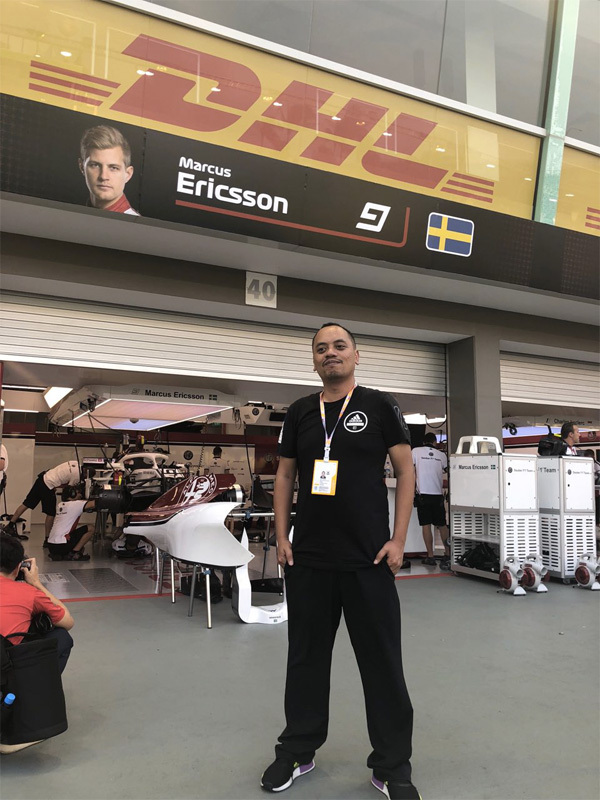 The instructors were very accommodating and helped the participants to go through the activities – the Slalom course, the Race Start Simulation and the Drifting Session. 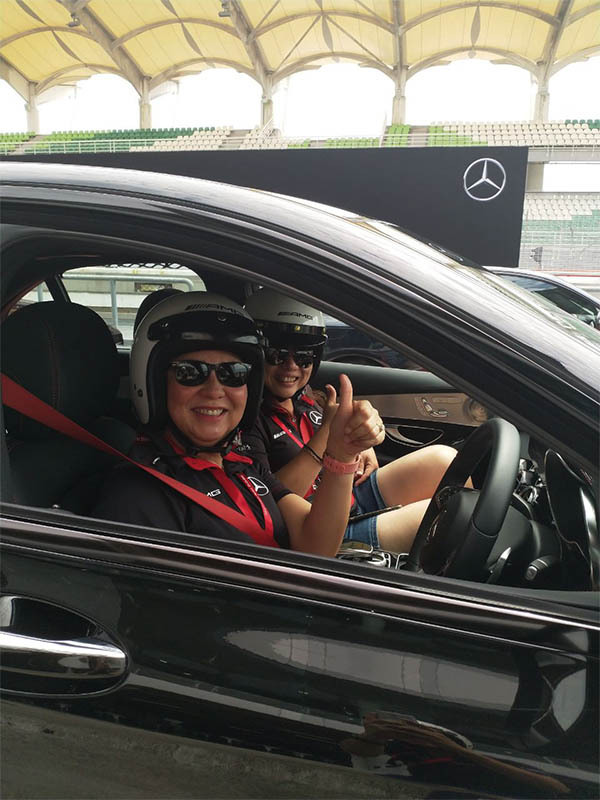 I actually enjoyed all the activities and especially the lapping sessions which took place after lunch. 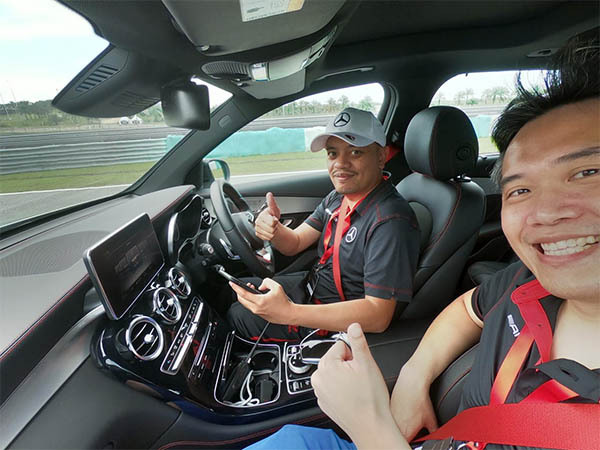 This meant we were able to drive the whole track of the Sepang International Circuit and we took turns to drive all the models prepared by MBM. 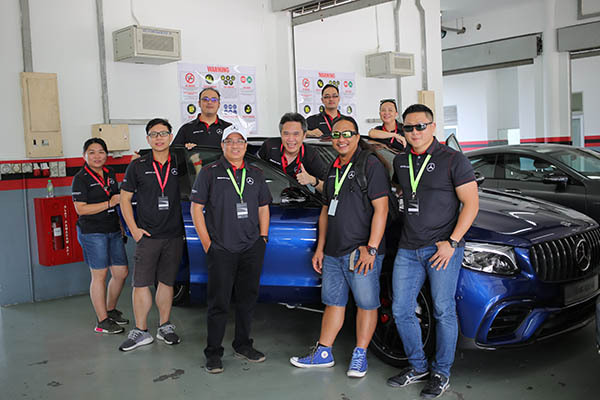 I didn’t try the Taxi Ride session where the instructors did a hot lap session so the participant got to experience how professional racers drive on the track. 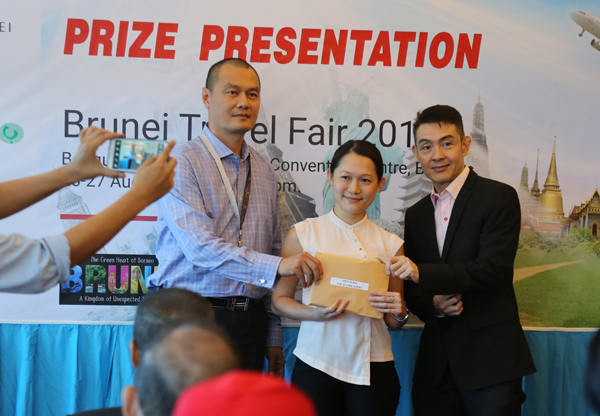 The Brunei participants didn’t go empty handed as we walked with goodie bags and also certificate of participation. 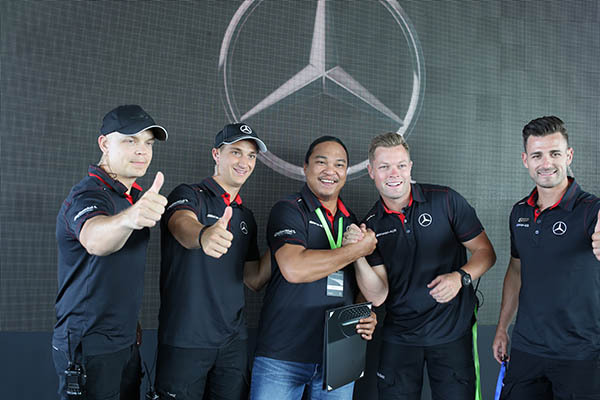 One Bruneian, Reuben Fang, was awarded the Best Male Driver by the organiser. Awesome, huh? Congratulations, buddy!! 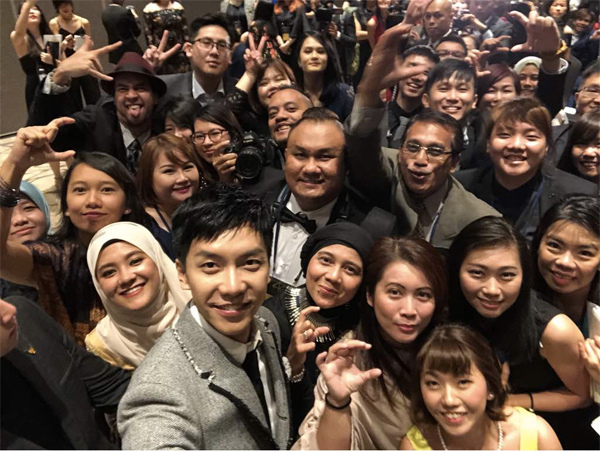 I could tell that the Brunei group had fun during the one day event. 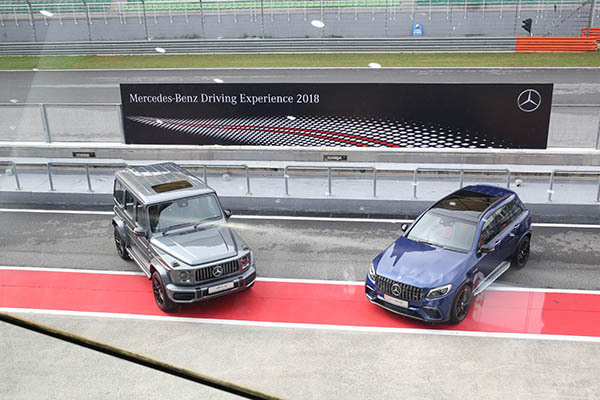 They also took the opportunity to take photos with the newly launched AMG G 63 and also the AMG GLC 63 which were being displayed at the Sepang International Circuit. 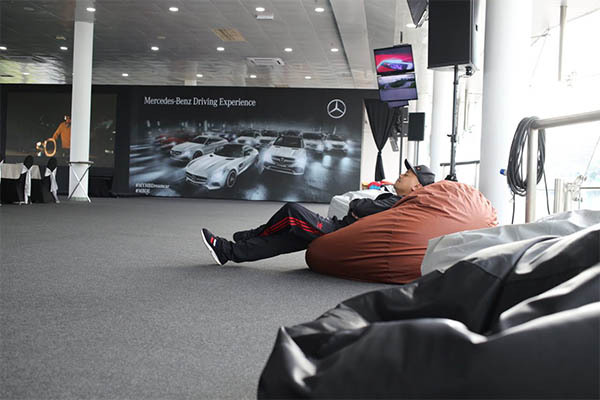 Let’s hope this sort of event will be a yearly thing for Mercedes-Benz customers. 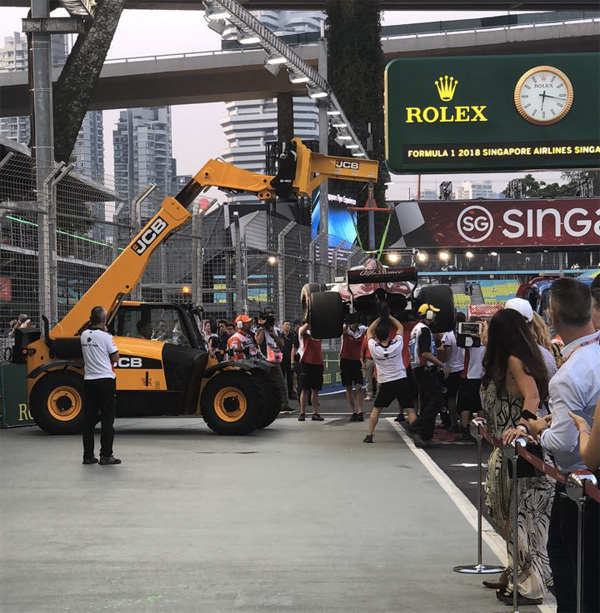 I wonder what models will be introduced in the next driving event. The drifting session with the A200/A250. I kinda enjoyed this. 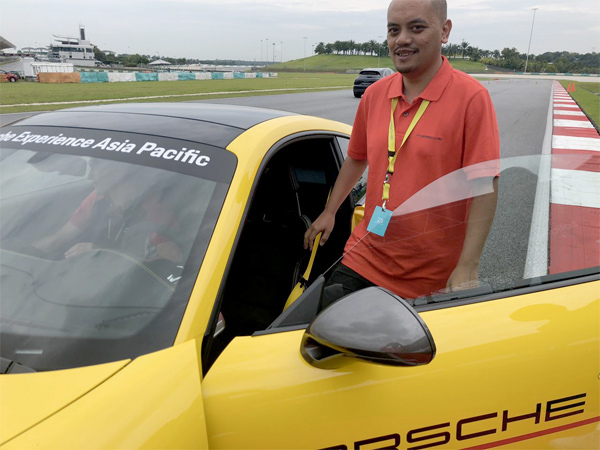 Last year, I had the privilege to attend the Media Driving Academy (MDA) hosted by Porsche Asia-Pacific. 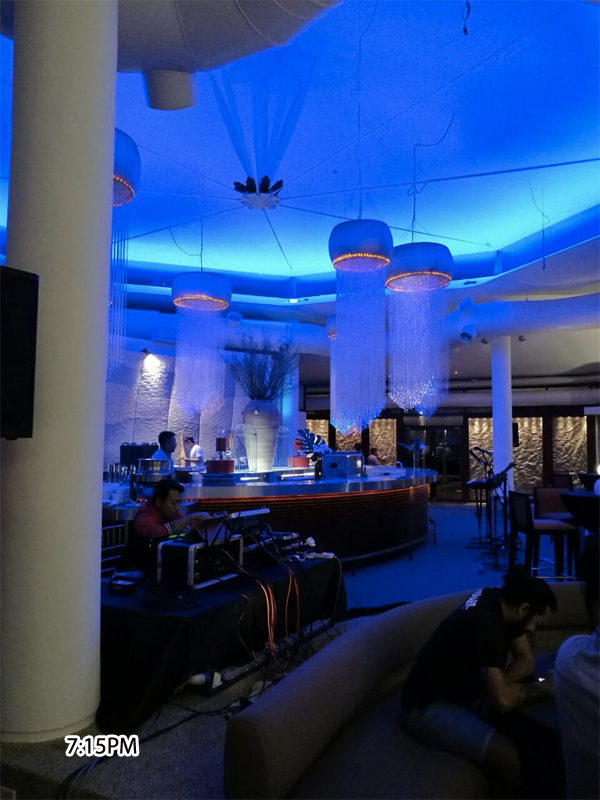 They consisted of three courses – Individual, Professional and Elite. 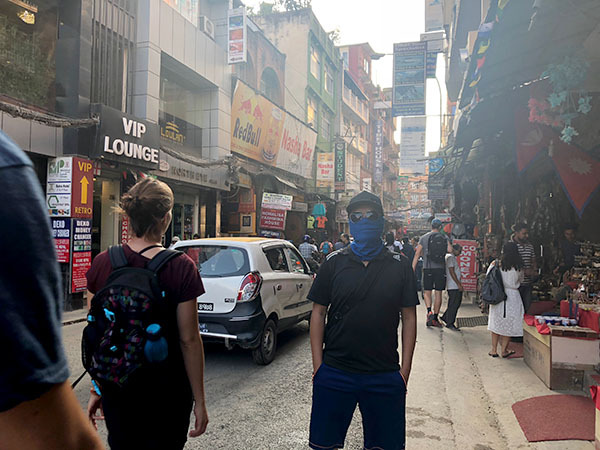 As for last year, I entered the Individual course which is the basic course among the lot. 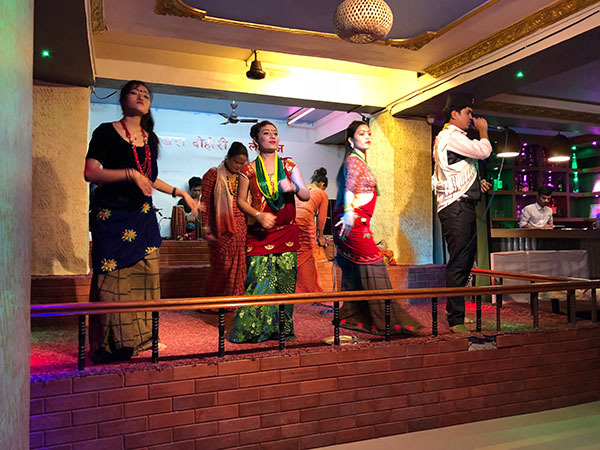 It was definitely fun. Why? 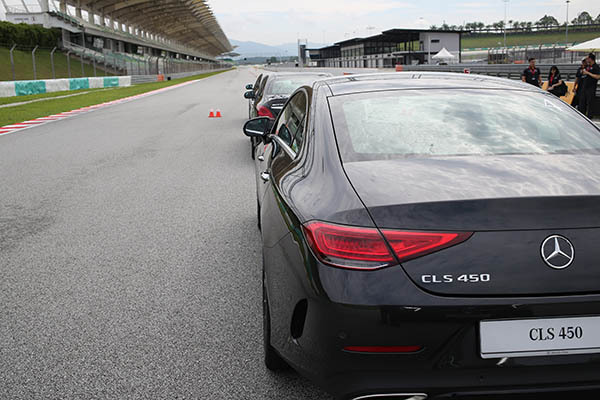 Because it’s the only time we can break the rules in terms of speeding on the road and it was conducted at the Sepang International Circuit, ideal for racers. 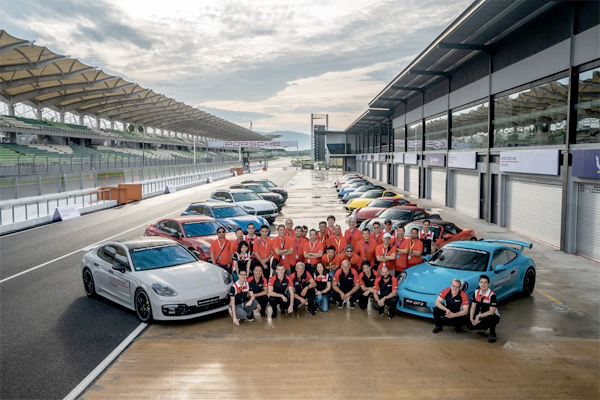 Fast forward to this year (July 2018), I was invited again by Porsche Asia-Pacific where I completed the other two courses – Professional and Elite earlier this month. 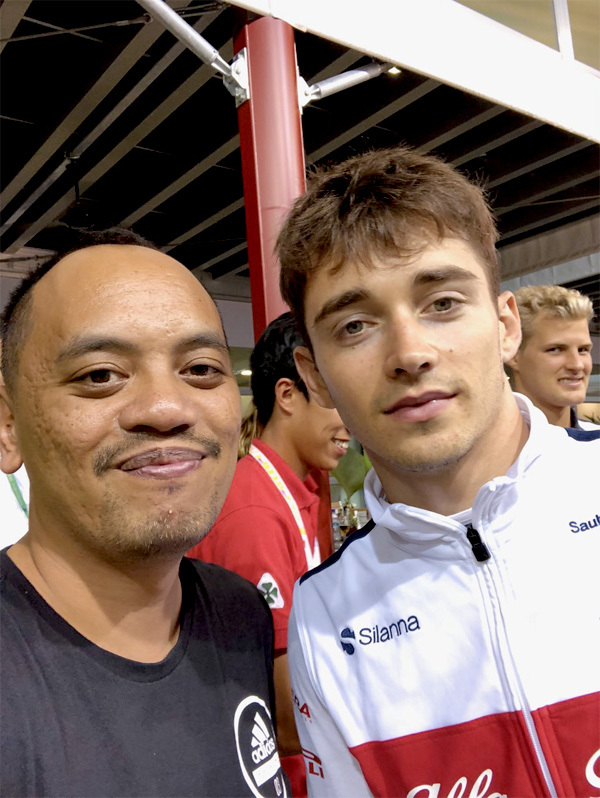 I met familiar faces especially from the international media representatives in Asia-Pacific. 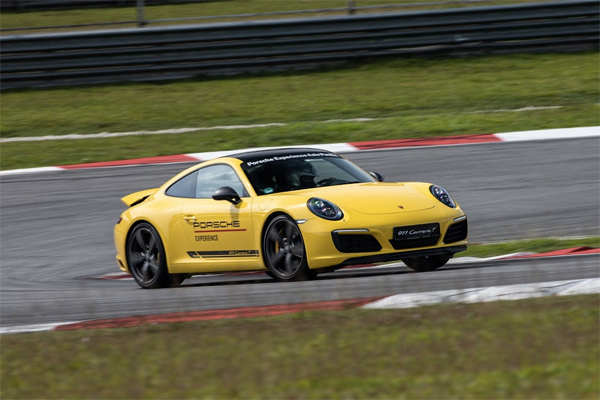 There were two main highlights for me – the launch of the Porsche GT2RS and the driving experience of the Porsche GT3. Firstly, the Porsche GT2RS. Wow, wow, wow!!!! A beast among beast, this is a collectors item for Porsche lovers. Car and Driver even labeled it as the chainsaw of the 911 line-up. 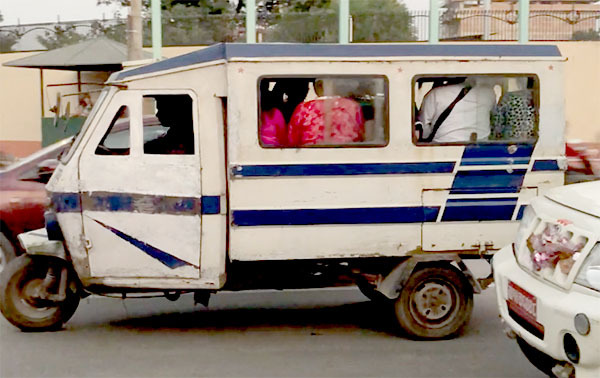 It has a 700 horse power twin-turbo engine. The previous GT2 model has a hp of 620 so there is definitely a difference. You can tell that the GT2RS is built for speed. The price tag alone is quite high. You’re talking about RM 1.3 million itself in Malaysia. 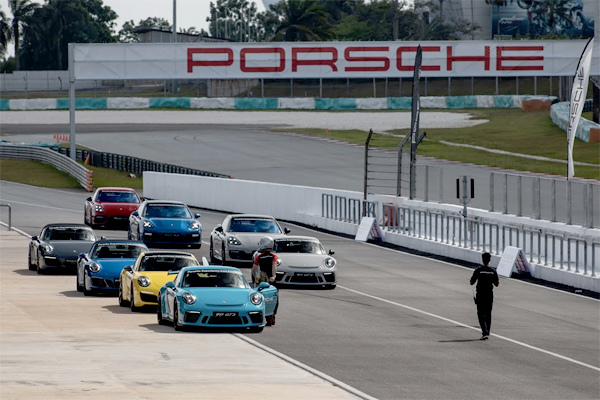 Apparently there’s a Porsche GT2RS on the road in Brunei. Amazing!! 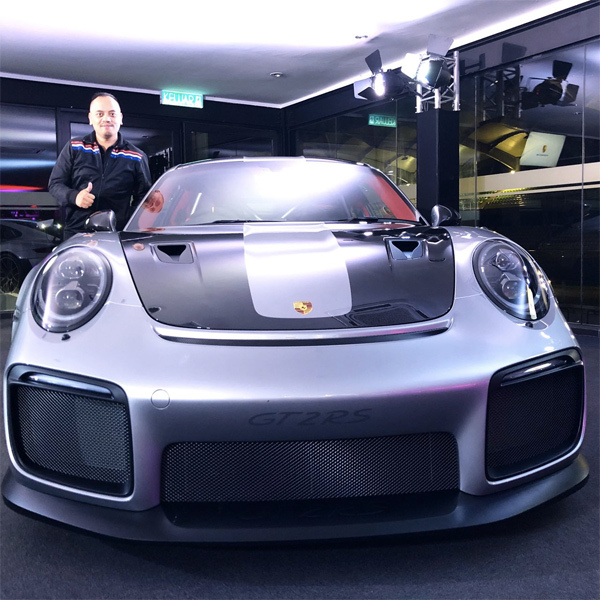 Sadly, the GT2RS is only for display for the media and not for a test drive. 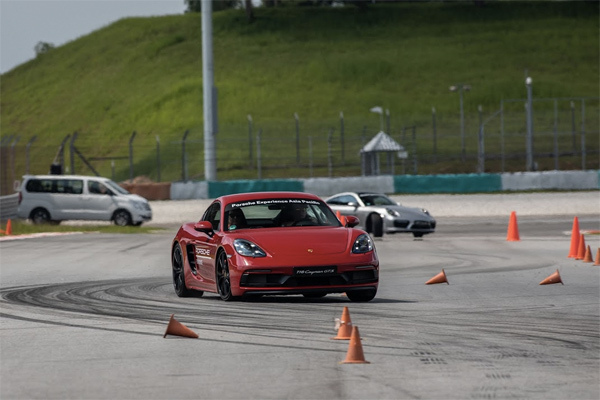 Of course, the main highlight of the MDA was test driving the newer editions of the Porsche finest models – 911 GT3 (me likes), 718 Cayman GTS and the Panamera Turbo S E-Hybrid on the SIC race track. The favourite among the lot for me is the 911 GT3 – simply awesome and it has a mind of its own. I truly love the handling at high speed as well as the braking. It just gives me more assurance to drive safer especially on the race track. 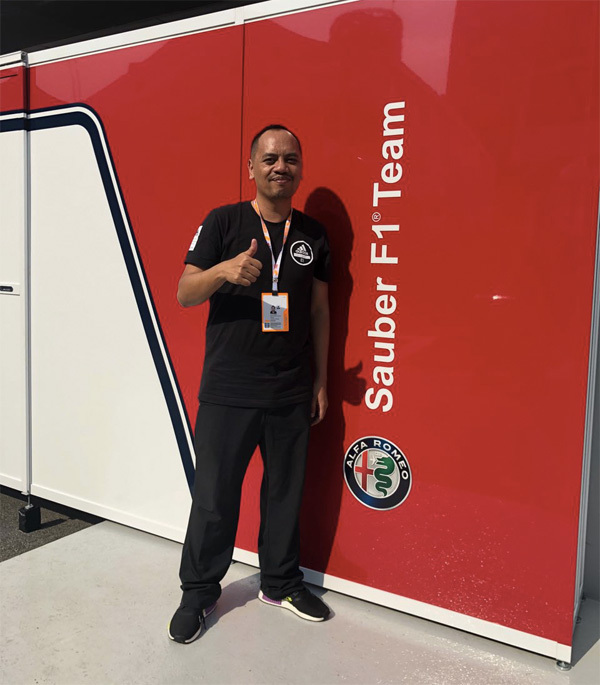 The instructors were very helpful too and our group (Brunei, Indonesia, Cambodia) was lucky to have William Bamber, brother of Earl Bamber, an accomplished race car driver, who competes for Porsche Motorsport. 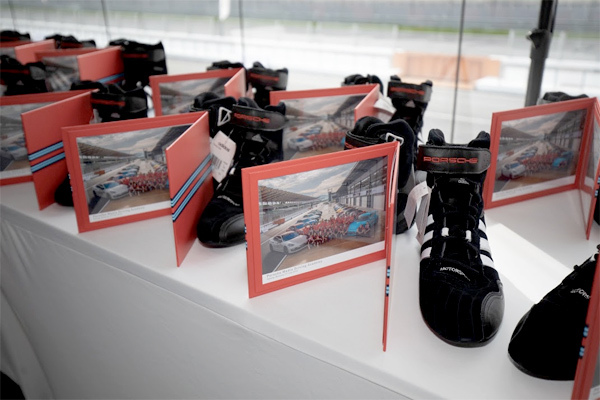 The hospitality was top notch to begin with and the goodies were awesome too – Adidas racing boots and a racing helmet for completing both Professional and Elite courses. 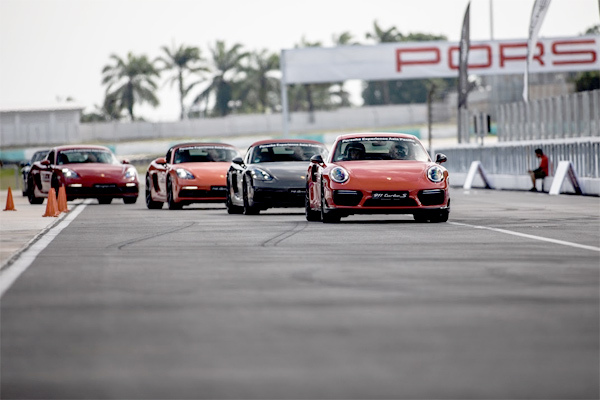 After all the experiences, I truly understand how magnificent Porsche are in terms of handling, speed and safety. We were given tasks such as the Slolam, the Moose, the Braking and many more. I enjoyed the Slolam one as we did a time lapse for every driver to see who was the fastest. 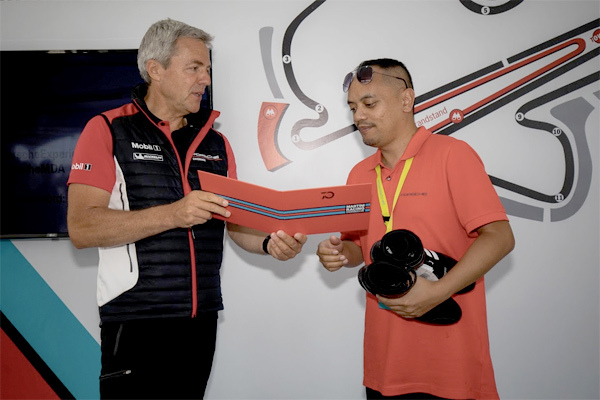 The second day was much more interesting as we learnt the tracks of the SIC race track from start to finish. I realised how awesome Porsche are on the road. Expensive but you will know where the money is spent on. 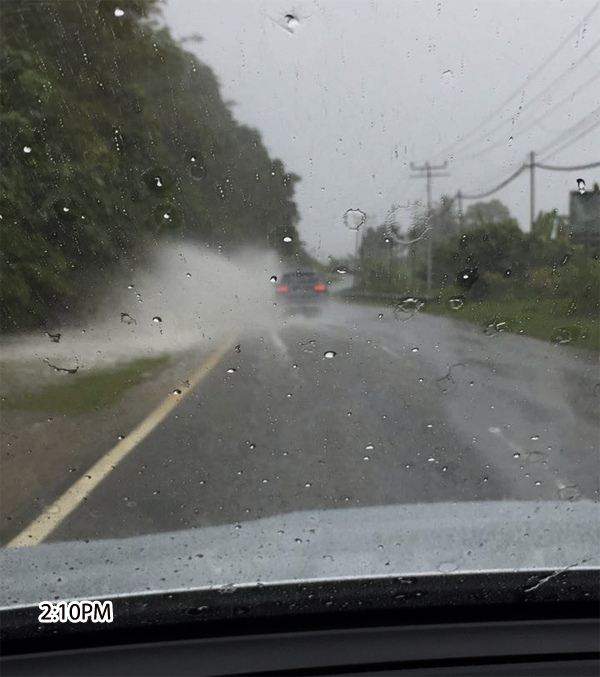 Unfortunately, in Brunei, it’s not something we can take advantage when we have a monster of a car like Porsche because of the driving laws and also the conditions of our roads in Brunei. 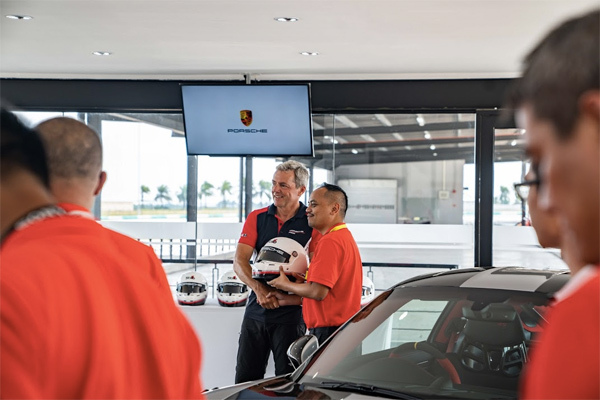 Soon, some selected customers will be having their own session organised by Porsche (Brunei) in early August for the upcoming Porsche Driving Experience at Sepang. I hope they have the same experience as I did and it’s also a great way to showcase what a Porsche can do. 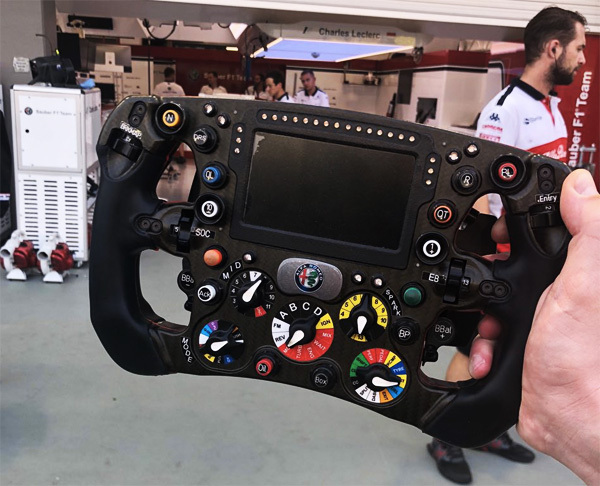 Did you realize that the driver side is on the left? Yes, all the Porsche are imported from Europe. We had some physical exercises as well. 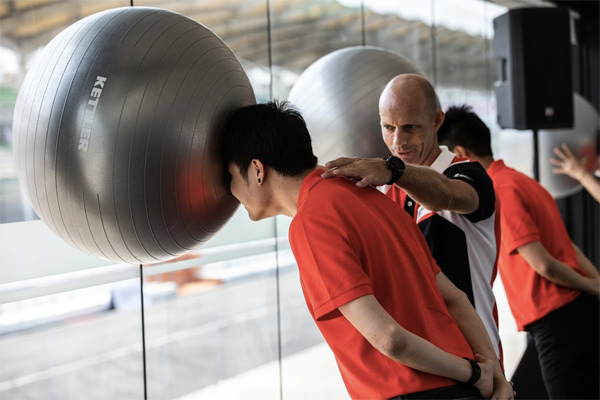 Did you know that racing also involves a good physique such as your hand, neck and body? 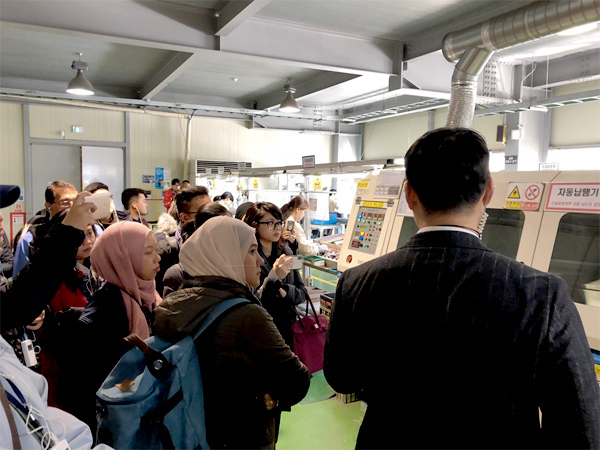 What a fortunate treat for the local media from Brunei who had the privilege to visit the factories of CUCKOO (multi-cooker and water purifier). 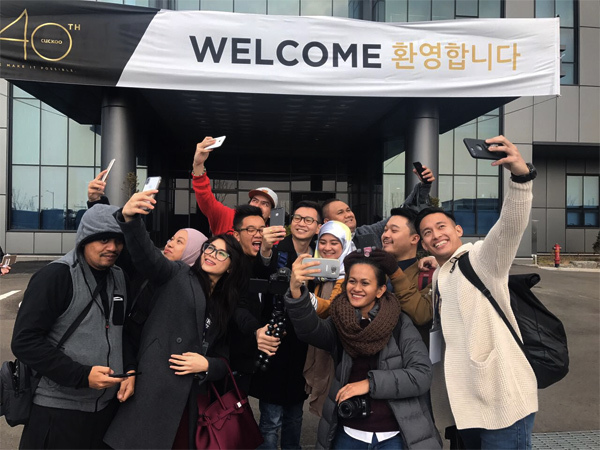 The first visit was at Yangsan factory located in Busan, South Korea. 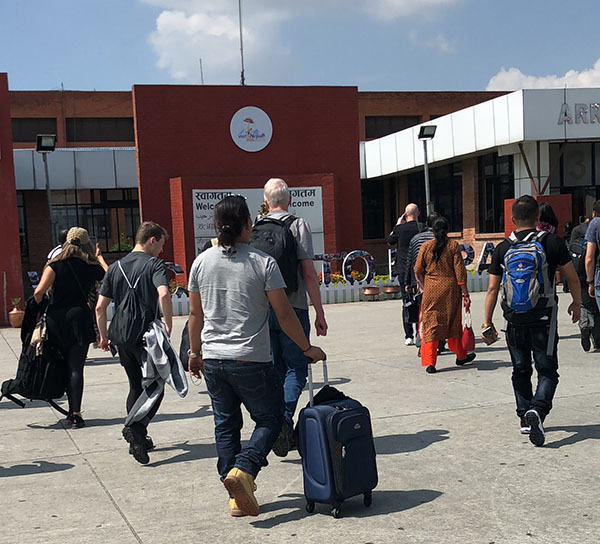 I would have thought it would be stricter for companies as big asCUCKOO to allow visitors to see the production line of CUCKOO. 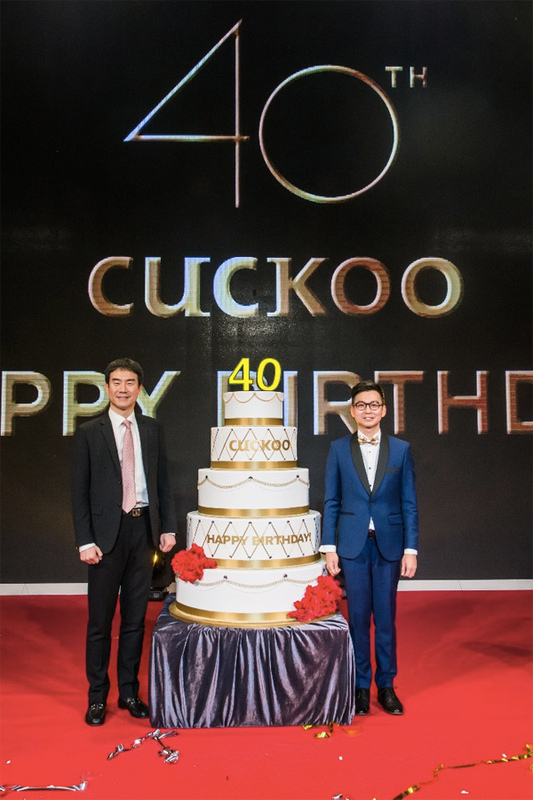 So it was such a fitting trip that we as the media were given the opportunity to see how a strong brand likeCUCKOO made it so popular in the Asia Pacific. The Yangsan factory we visited mainly focused on multi-cookers and kitchen appliances. 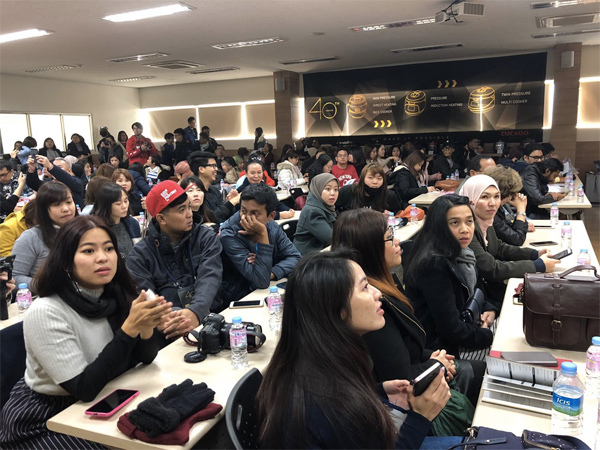 We were brought to the conference room where delegates from Brunei, Malaysia, Indonesia and Singapore were introduced to the management team of Yangsan Factory. 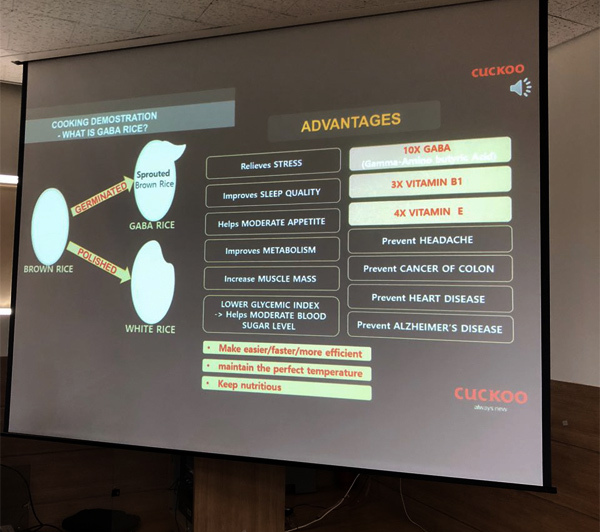 We learnt that CUCKOO’s multi-cookers are known for four things: Smart Algorithm, Pressure Cooking, Heating Technology and Coating Technology. These advanced technologies helped one to prepare food or meal at a touch of button. 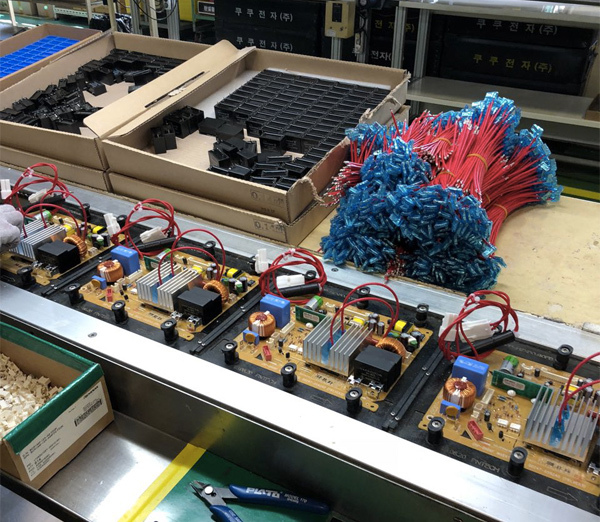 At the factory itself, we had a sneak peak on how the functions were created. For a person who rarely cooks and maybe most of the readers here, how does pressure cooking really helps or an advantage? Imagine you don’t have enough time to cook. By using CUCKOO’s multi-cooker, you can save 70% of your cooking time and that’s with the help of the pressure cooking technology inside CUCKOO multi-cooker. This is very ideal for the working class who has limited time when it comes to cooking. It’s really hard to explain to those who aren’t familiar with cooking. But I can guarantee you that once a CUCKOO multi-cooker in in your hands, you won’t regret the purchase. 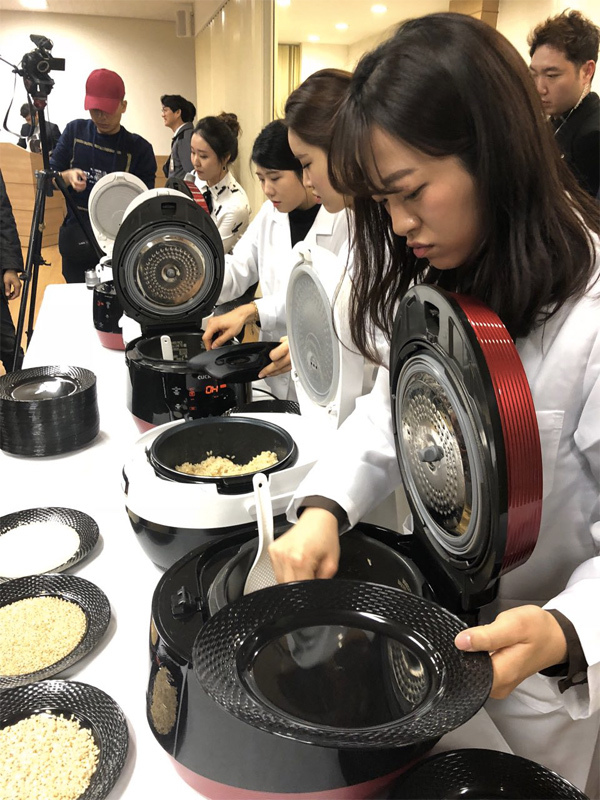 It’s no surprise why 70% household in Korea uses CUCKOO brand for their cooking and that shows the Korean really trust their products. 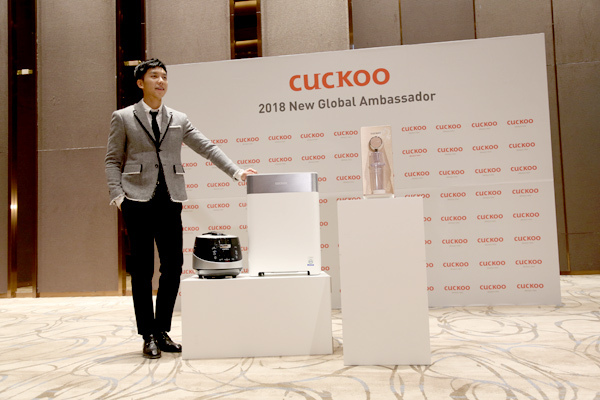 For the record, CUCKOO multi-cooker is sold every 10 seconds in South Korea. How I wish I had the same business model like CUCKOO. 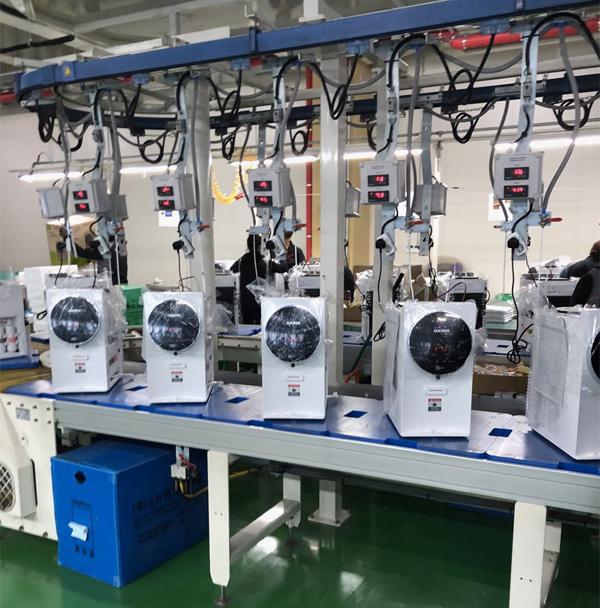 Now saying all that, all these technologies infused in CUCKOO’s appliances are manufactured at Yangsan factory. 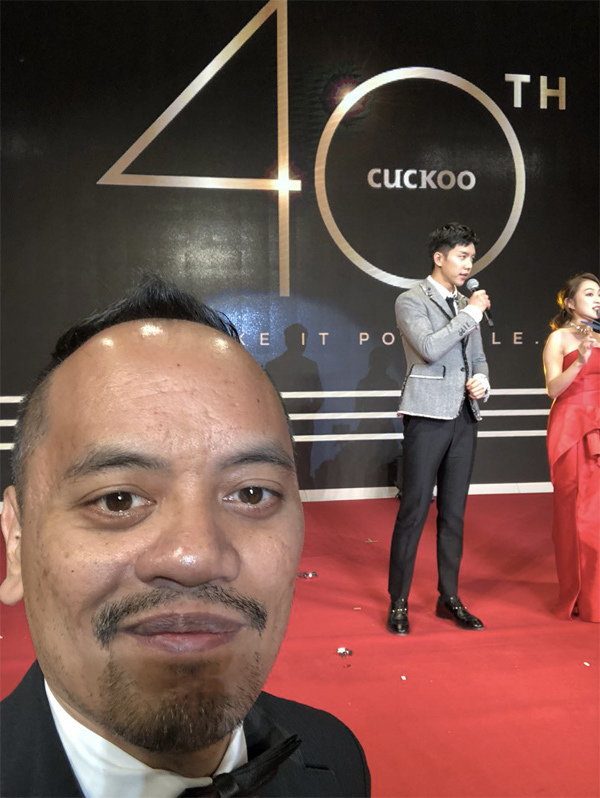 We saw some of the production lines within the premise and I was impressed with the dedication and precision by the CUCKOO factory workers. You will be surprised the average age of the workers which is around 24-25 years old. 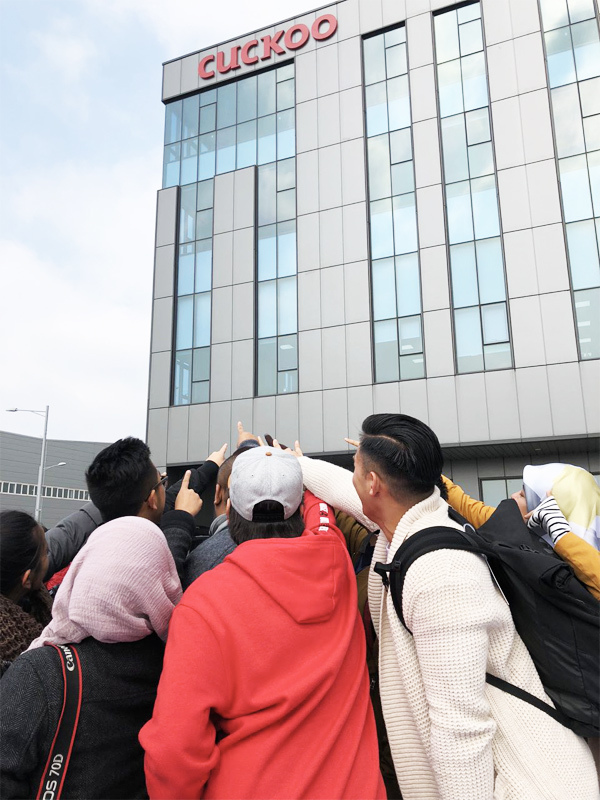 We also had the privilege to visit the Siheung Factory which focuses more on water purifier. 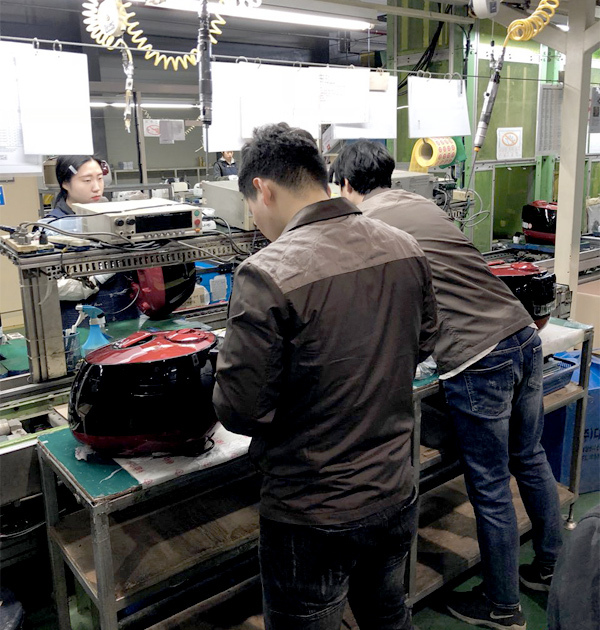 It has a similar production line concept like Yangsan and it’s located closer to Seoul. 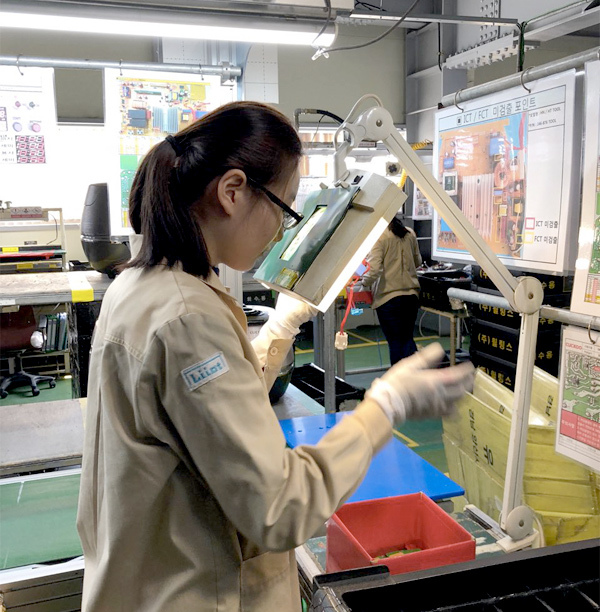 With the two plants in South Korea, they are able to produce more than 4.5 million set annually. They have around a few hundred workers working behind the scene. 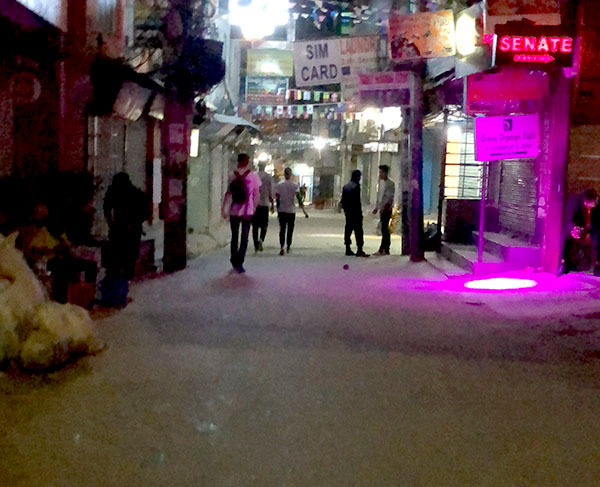 All they focus is just their tasks given and I hardly see them having a conversation among themselves. 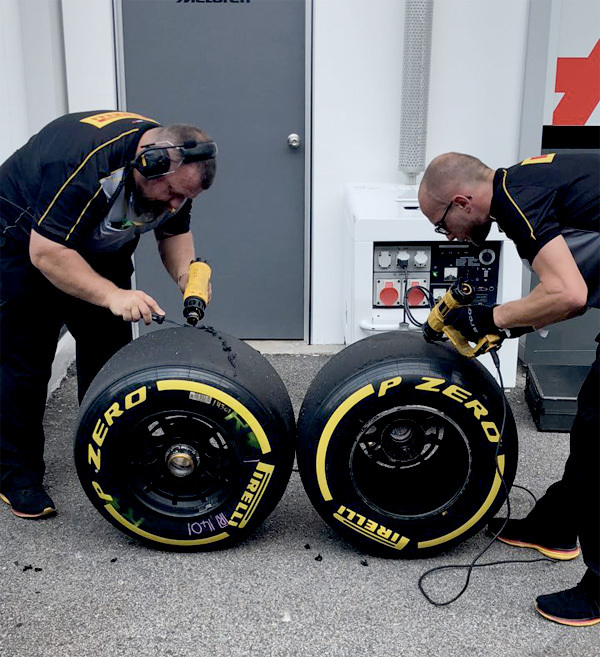 It’s as if they are like human robots in the production line. 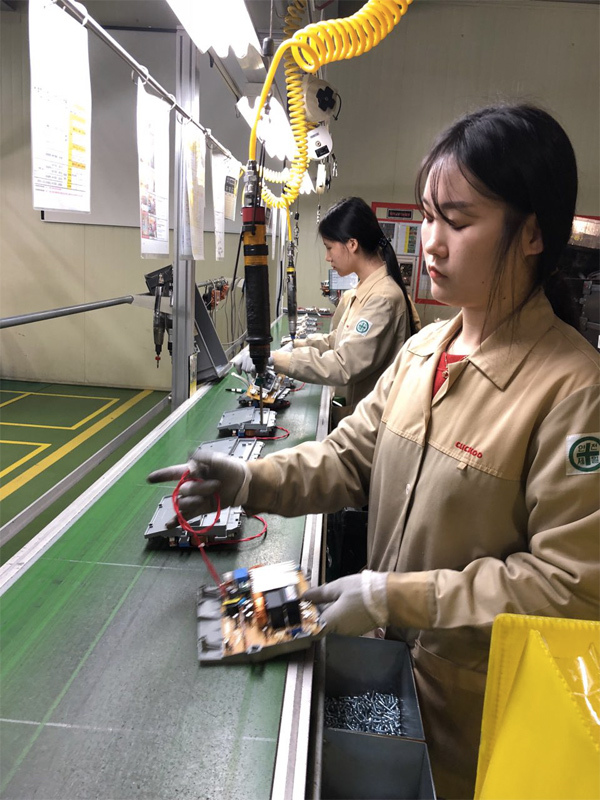 That’s how discipline the workers are in the factory. 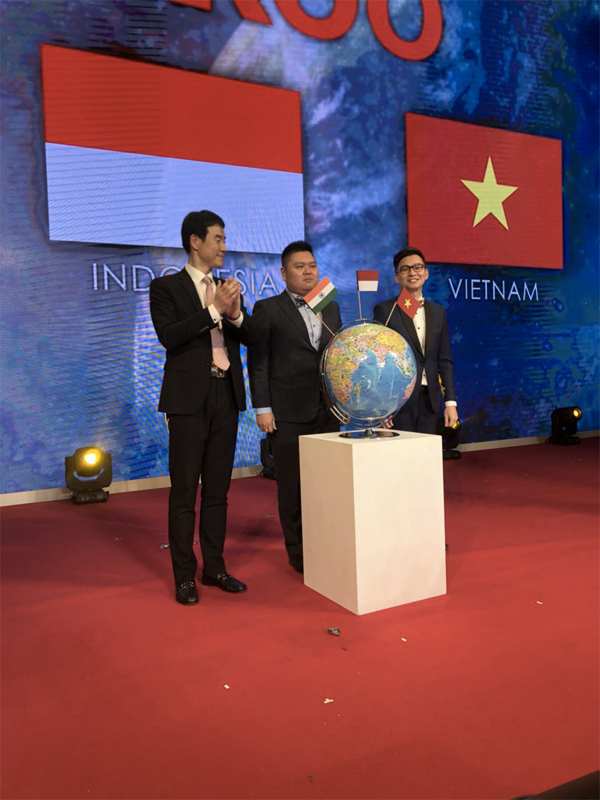 Interestingly enough, Brian Koo Bon Hak, the CEO of CUCKOO Electronics Co. Ltd, mentioned of a plan to build a RM 100 million factory in Malaysia to produce water purifier products. 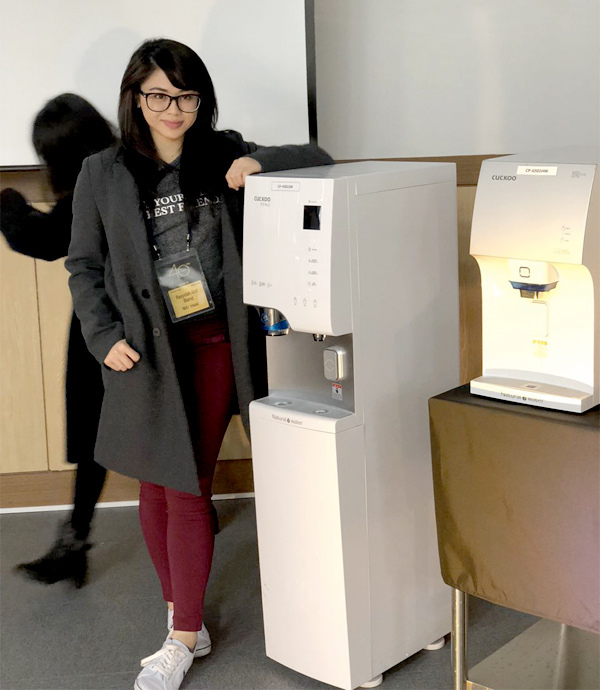 This will help to bridge the demand gap due to the rapid growth in Southeast Asia and Brunei is one of the emerging markets in the water purifier category. 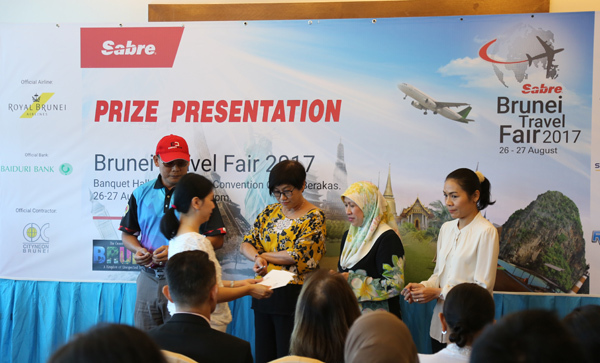 Sabre Travel Network (Brunei) Sdn Bhd hosted the Brunei Travel Fair 2017 last month at the Banquet Hall, International Convention Centre and yesterday was the prizes presentation to honour the winners of the lucky draw campaign that took place during that weekend. So how did it fare? Pretty good in fact. 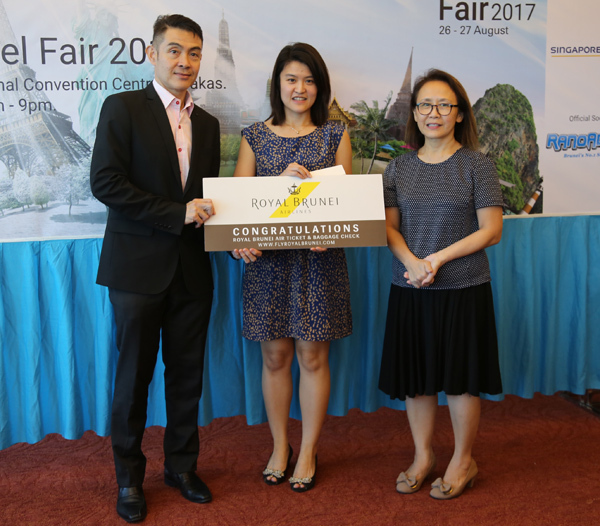 It attracted more than 13,500 visitors to the travel fair and the bookings received increased by 24% from last year’s. 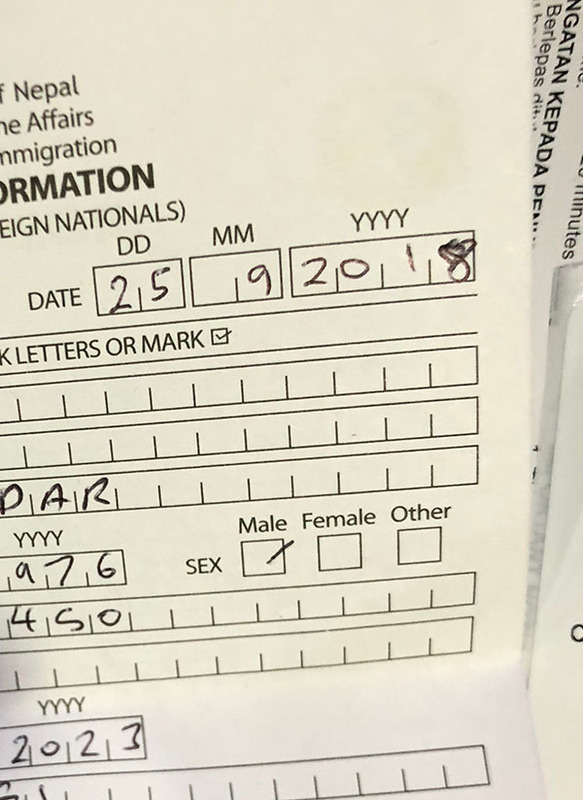 That’s pretty encouraging number considering the economic climate of Brunei Darussalam. 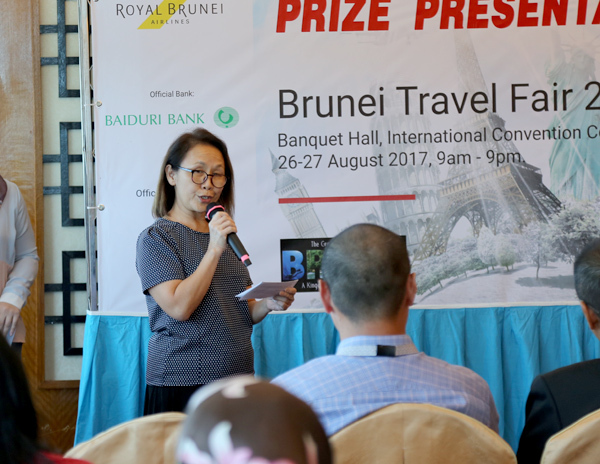 Irene Soon, General Manager of Sabre Travel Network (Brunei), appreciated all the partners and supporters involved in making the travel fair another success. 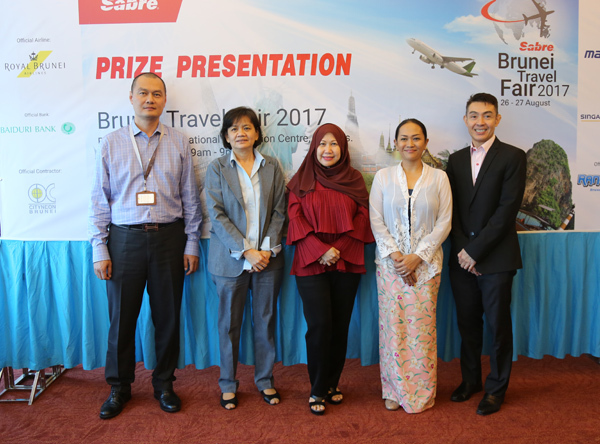 The prize presentation ceremony took place at Emperor’s Court and it was attended by Sabre Travel Network (Brunei), Baiduri Bank, Royal Brunei Airlines and travel agencies. 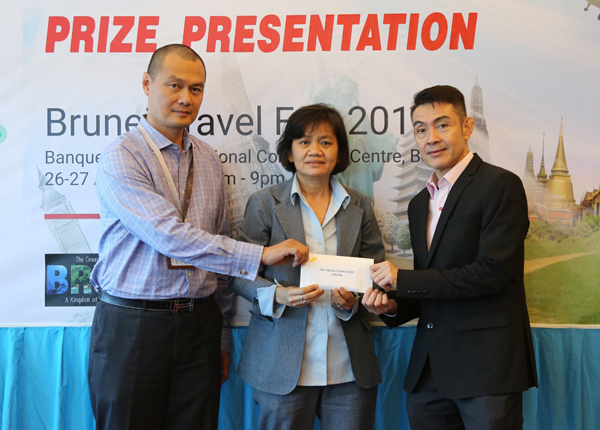 The prizes were sponsored by Sabre Travel Network (Brunei), Baiduri Bank, Royal Brunei Airlines and Malaysia Airlines. 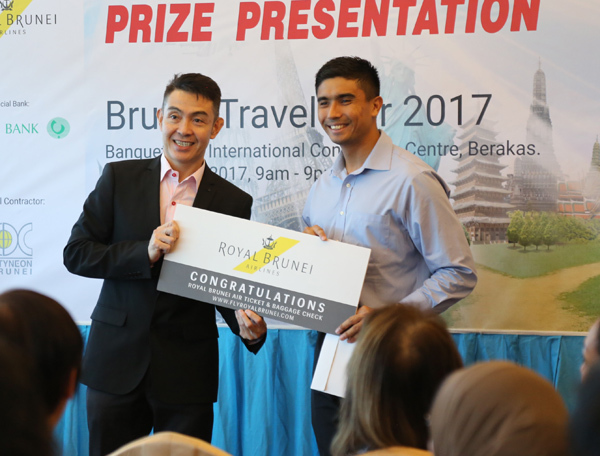 Wan Farhan Hj Ibrahim won a return economy class air ticket to any Royal Brunei Airlines short haul destination. He won in Category B for the Fidget Spinner competition. 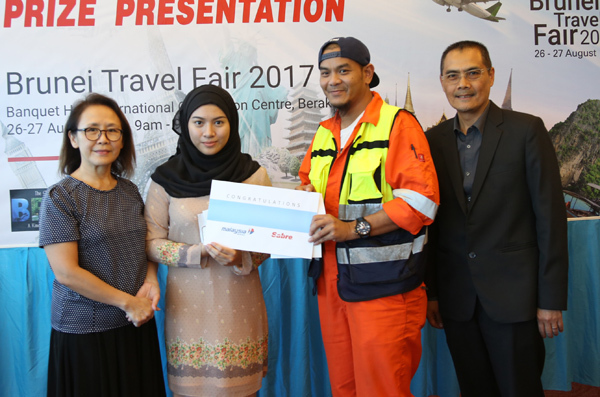 Malaysia Airlines sponsored returned tickets and the winners were Dk Majeedah Pg Hj Jeludin, a return flight ticket to Penang via Kuala Lumpur and Muna Atiqah Abdul Nadir, a return flight ticket to Langkawi via Kuala Lumpur. Royal Brunei Airlines sponsored air tickets and Royal Skies Points and the winners were Lim Shar Lun, winning two return flight tickets to any Royal Brunei Airlines long haul destination, Mohd Saiffuddin Mohd Yusop, winning two return flight tickets to any Royal Brunei Airlines short haul destination annd Hj Shahri Hj Zainal, winning 50,000 Royal Skies points. 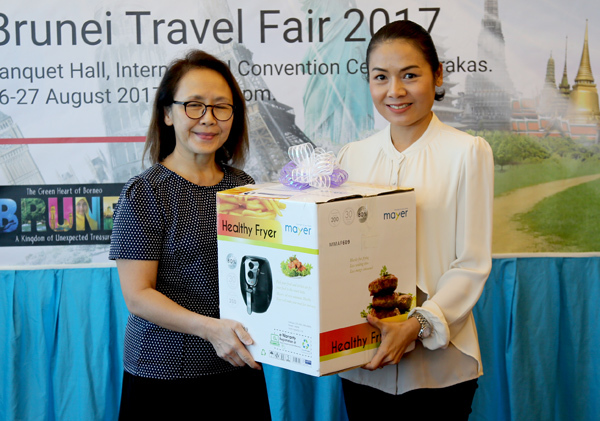 As for the Sabre Travel Network winners, they were Mahani Md Yussof (GoPro Hero 5), Norhayati Malai Abdullah (Matrix HD TV), Ms Chong Nyan Mee (Philips TV) and Malinee Bumrungkit (Mayer Healthy Fryer). 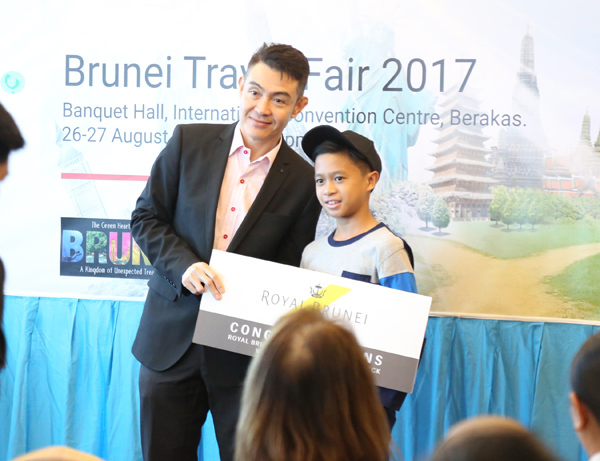 For the Fidget Spinner Competition organised by Royal Brunei Airlines, the winners were Md Shahirul Azuan Md Effendi for Category A and Wan Farhan Hj Ibrahim for Category B. 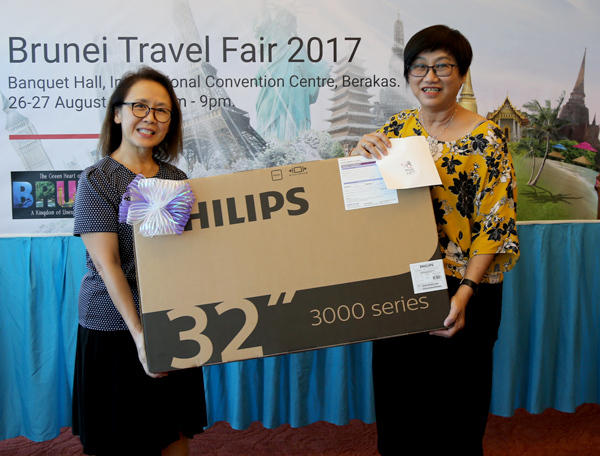 Both of them won a return flight ticket to any Royal Brunei Airlines short haul destination. 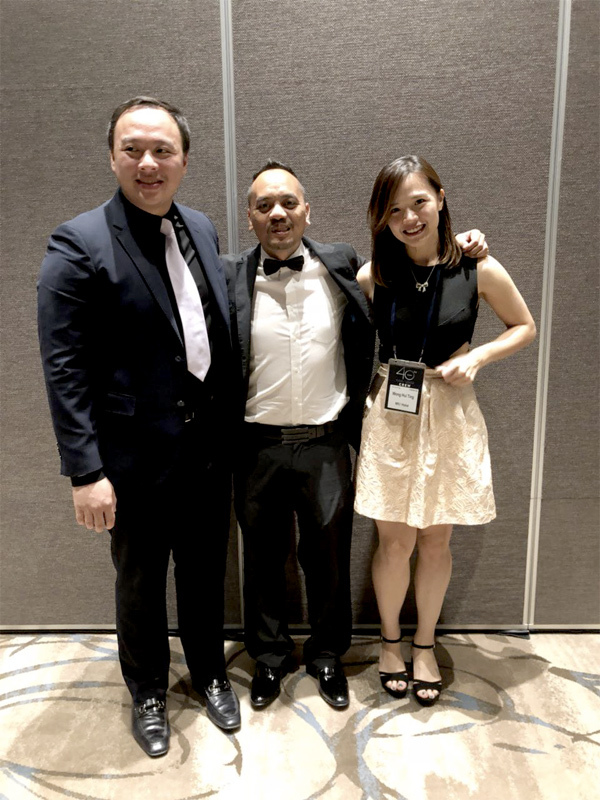 For the Travel Agent category, all the destinations – Ho Chi Minh, Kuala Lumpur, Singapore and London belonged to two travel consultants from Pan Bright Travel for their top selling destinations during the travel fair. 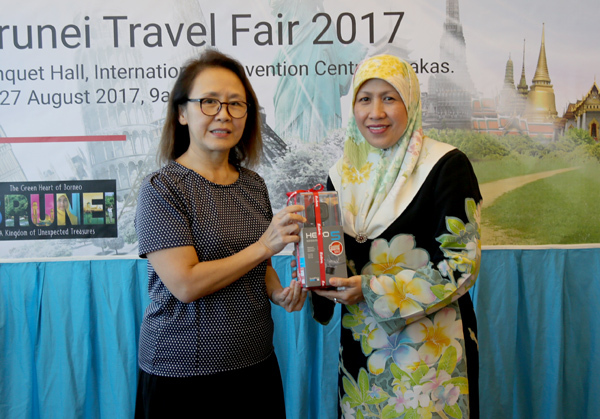 For the top Travel Agents award, Freme Travel Services came first while Pan Bright Travel Service came second and Darussalam Holdings finished third. 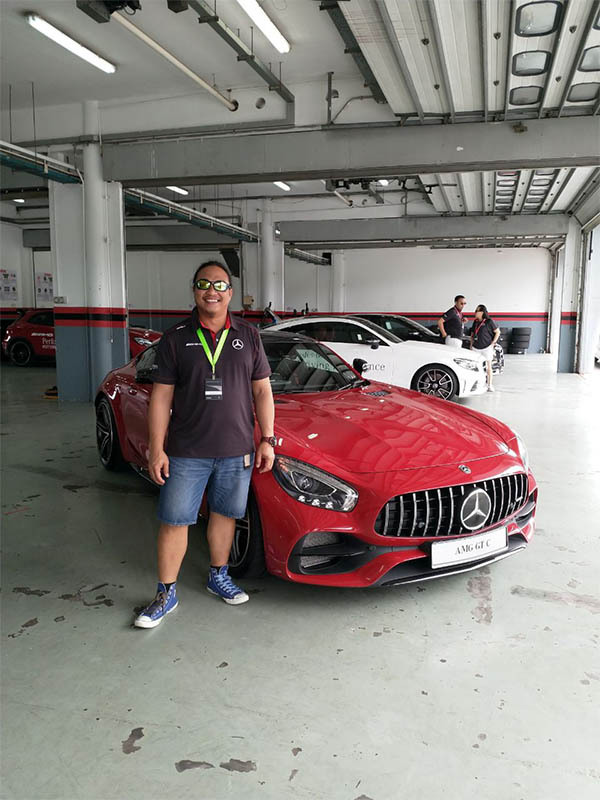 Mark Raine, Mercedes-Benz Cars vice-president of sales and marketing (Malaysia), has been active in the car scene lately, leading record sales for Mercedes last year with almost 12,000 units sold in 2016. 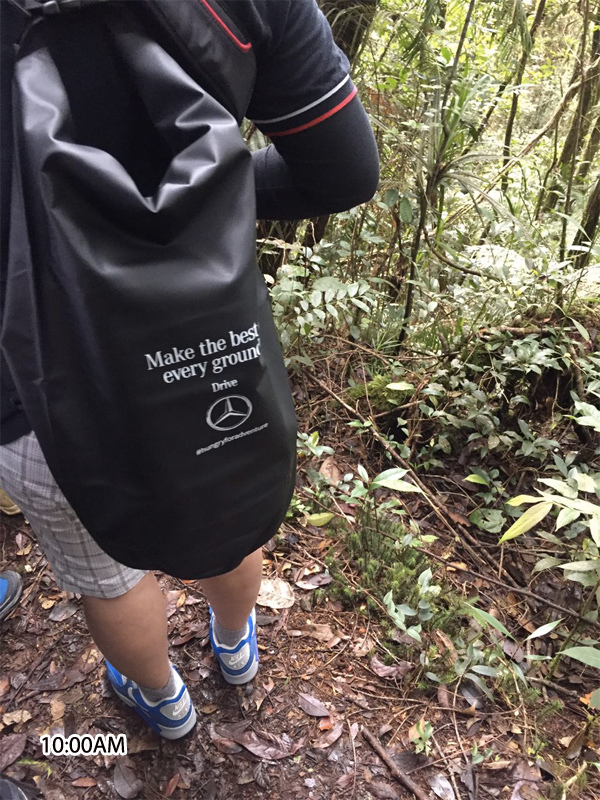 There are many interesting factors that contributed to the growth of Mercedes-Benz in Malaysia and also in South East Asia. 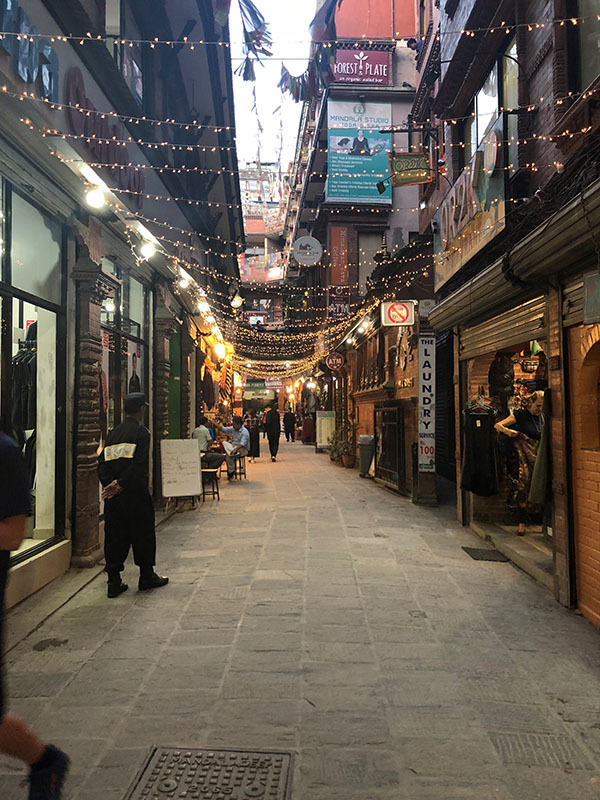 What has made the premium brand a success as of late? 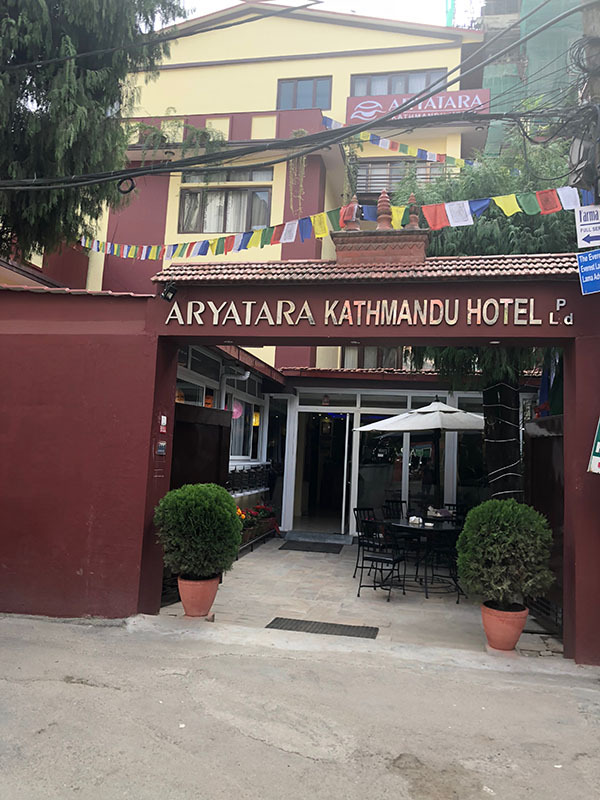 What are their recipes to success and sustainability? 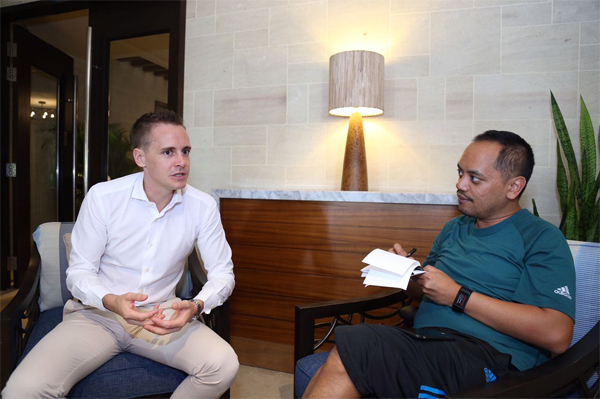 I have the privilege to interview Mark Raine during my short visit to Kota Kinabalu last week. Mark is a very easy going lad and very approachable. 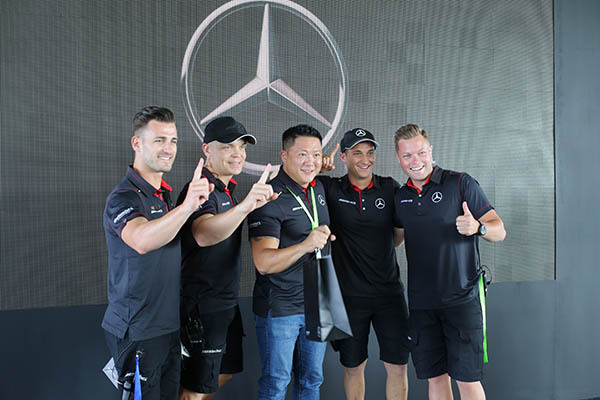 Thank you for hosting the media and customers last week and arranging a great three day event in showcasing how Mercedes-Benz is not just a product but a lifestyle. 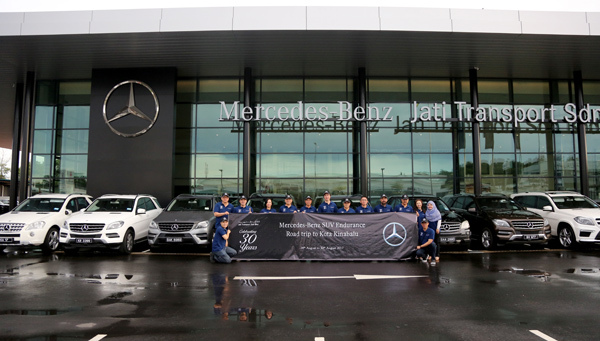 Rano Iskandar: Can you share the growth of Mercedes-Benz and its growing presence in South East Asia? 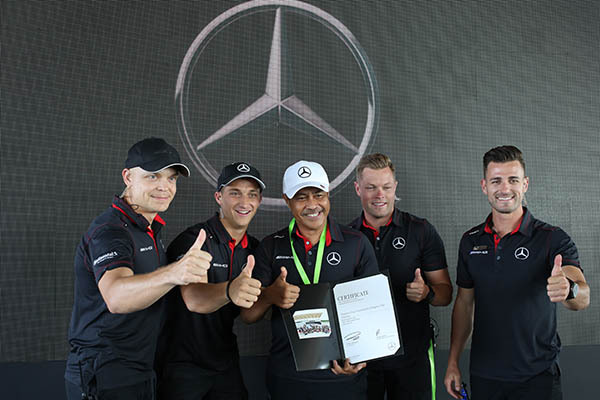 Mark Raine: I believe we have a holistic approach in our brand, Mercedes-Benz and this has been a huge factor in our growth and being a brand leader in the premium category. 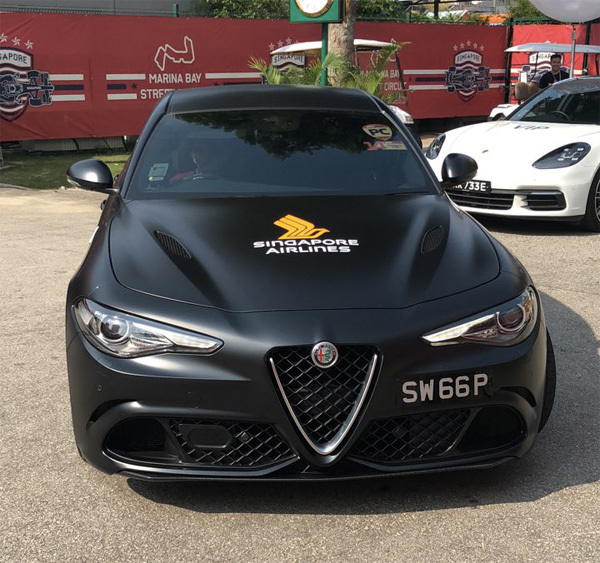 We don’t only have the best car but also focusing on customer centric in a way of doing our business, to give a more positive customer experience before and after sales. Even the process of buying a Mercedes is taken into account such as having a competent website, digital approach and also the consultation process. 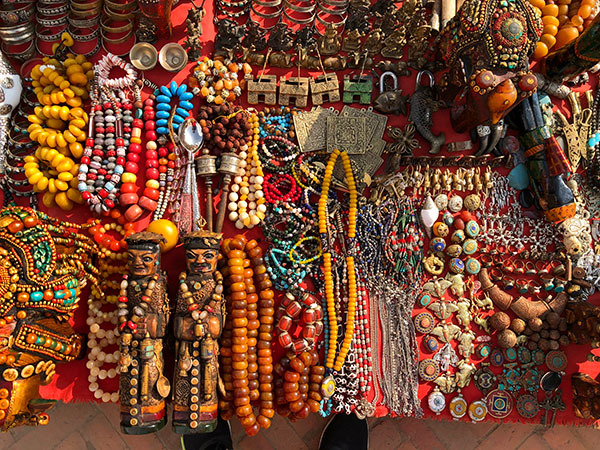 All these are essential in the buying process so in the end, the customers are happy with their choices. This is already half the victory in catering to what the customers want. 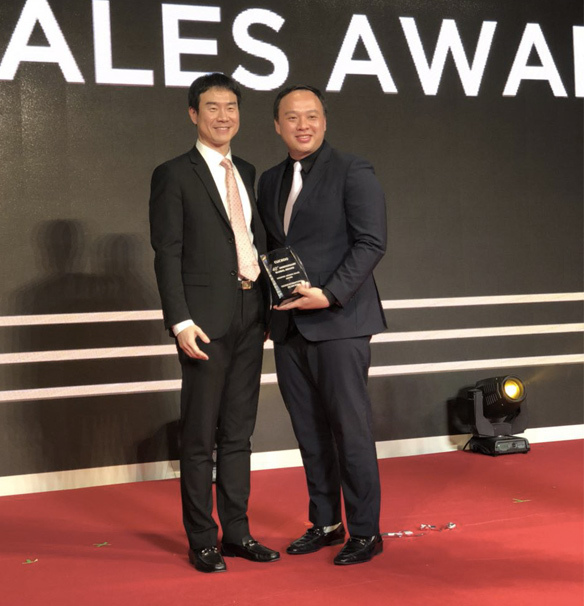 The real deal starts after the sales and we at Mercedes emphasizes deeply in this area as this will determine our loyalty of our customers. 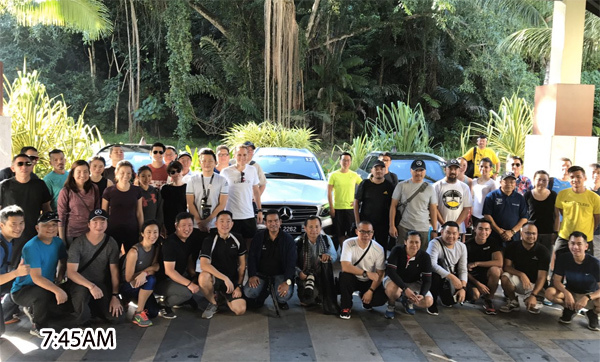 It has proven a success and it is no doubt that the growth of Mercedes in the premium sector has increased despite the downturn in the economy in SEA. 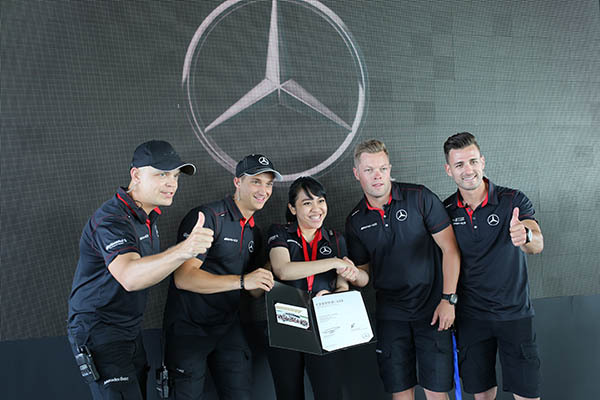 The extension of the models from Mercedes-Benz has helped to elevate the growth of the brand in the premium sector. These are such as the SUV models – the GLEs, GLCs and GLAs being introduced in the market. 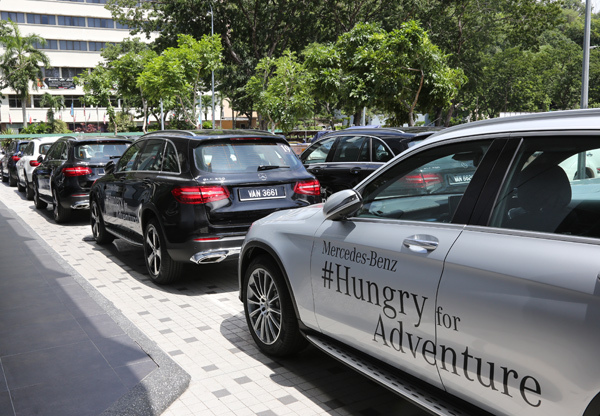 Rano Iskandar: Speaking of the trend, is this segment a huge trend in the region for Mercedes and how it came about? Mark Raine: Yes, this is more of a global trend that SUVs have impacting the trend. 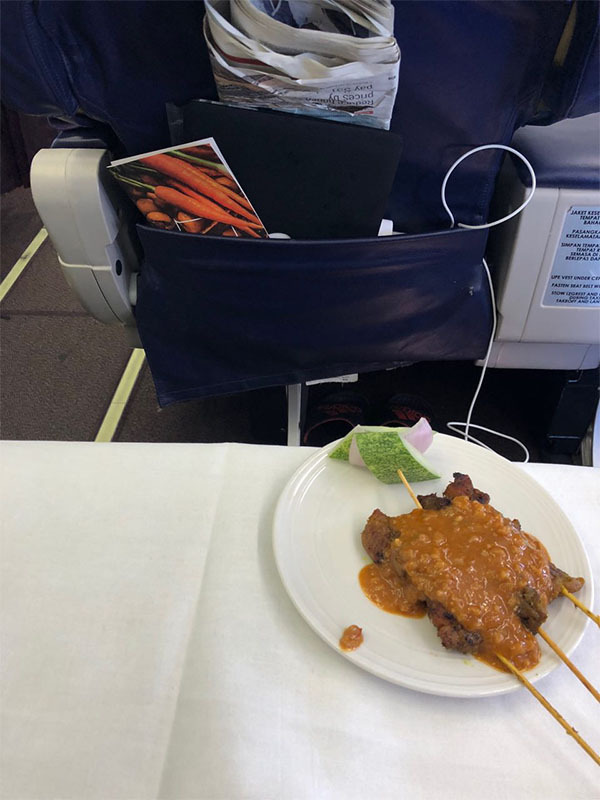 However, there was little choices in the premium segment. We have a gut feeling and took a gamble in this segment and we believed that SUV is the thing of the future. This was also the key element of positioning of the Mercedes brand (in the SUV segment), focusing on lifestyle and affluent customers. 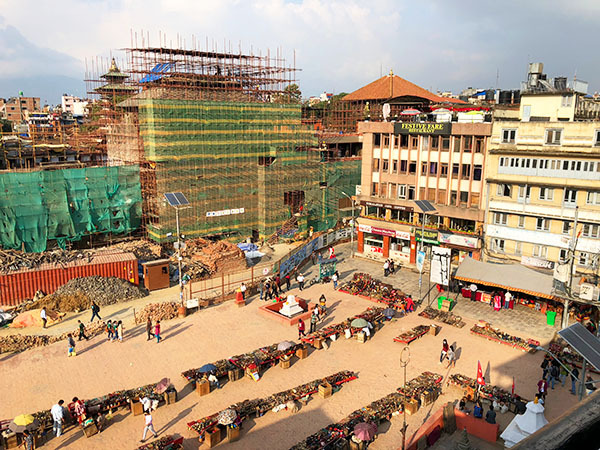 This has helped to rejuvenate the brand while improving on innovation and technology. 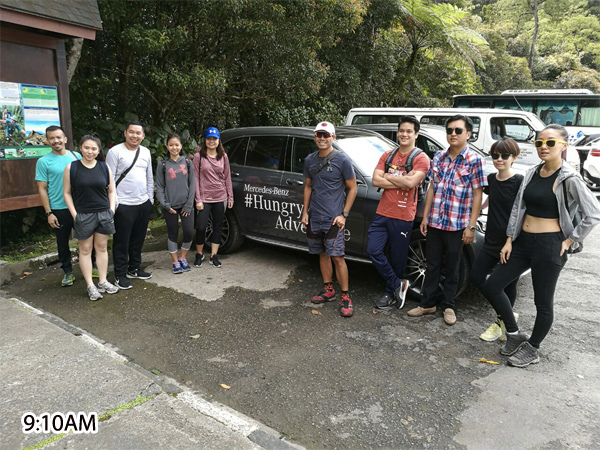 Rano Iskandar: Why Kota Kinabalu as the prime destination for the #hungryforadventure ? Mark Raine: The destination speaks for itself and we want to associate the mindset of our customers that our brand offers endurance, great positioning for different walks of life such as taking your children to school or on the weekend, bring your bike for a spin or going for a round of golf and lastly Kota Kinabalu gives a sense of adrenalin which resonates with our brand. 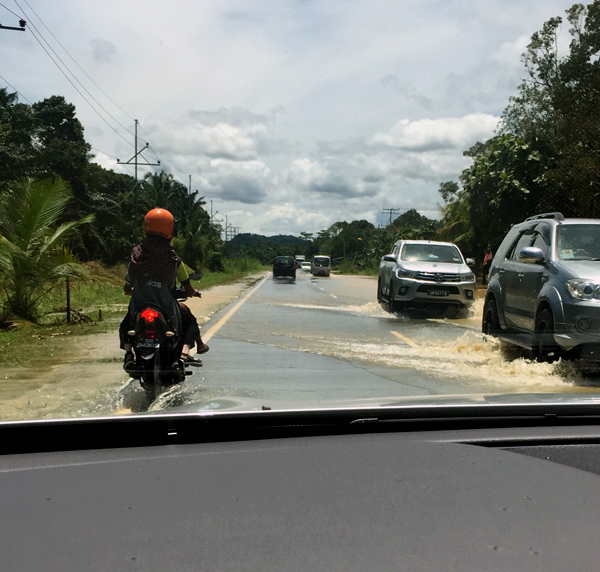 We were fortunate that we have different weather conditions during our hill drive this morning at Sabah National Park and it showed what our SUVs are capable of. 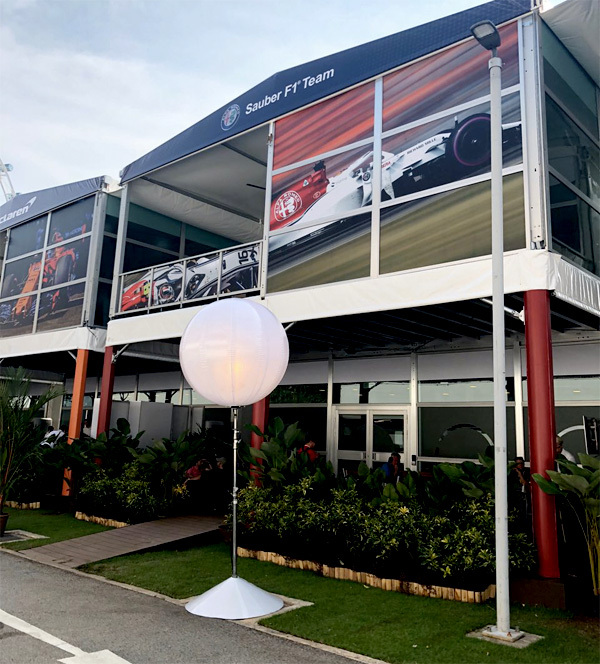 We at Mercedes tend to organize events like this twice a year. 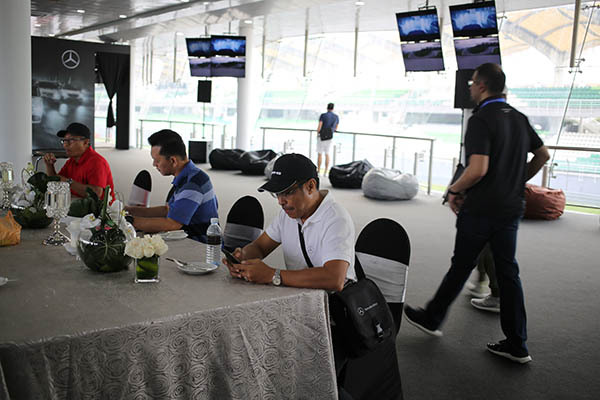 We will invite our stakeholders along such as the media, the customers to showcase what SUVs are about and also being a premium brand, we want to be approachable to our customers by having a touch and feel on what Mercedes have to offer. 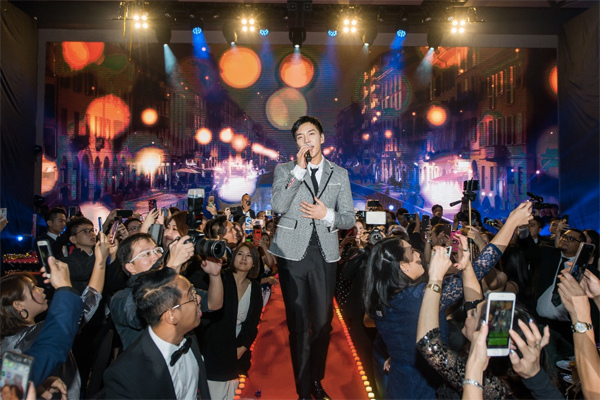 Rano Iskandar: Which model in Malaysia has been a top seller? Mark Raine: It will be the C class and it targets all walks of life. 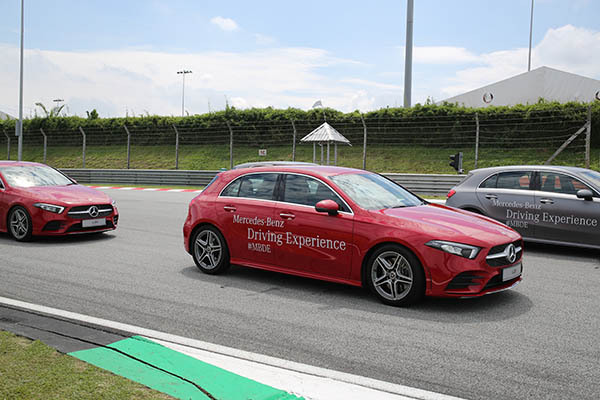 However, it’s not the only model that has been popular but the compact cars and other models such as the E Class that was launched last year in Malaysia. 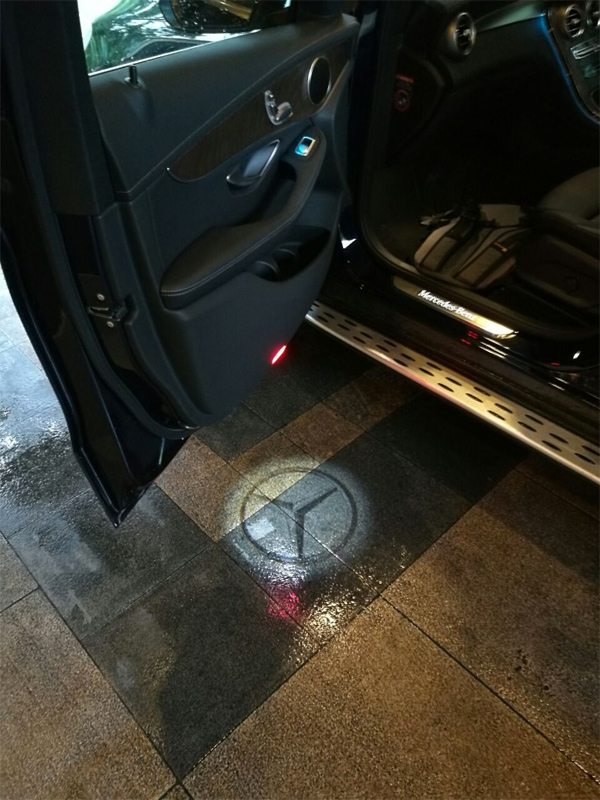 Pretty soon we will be launching the new E 350E the latest hybrid brand. 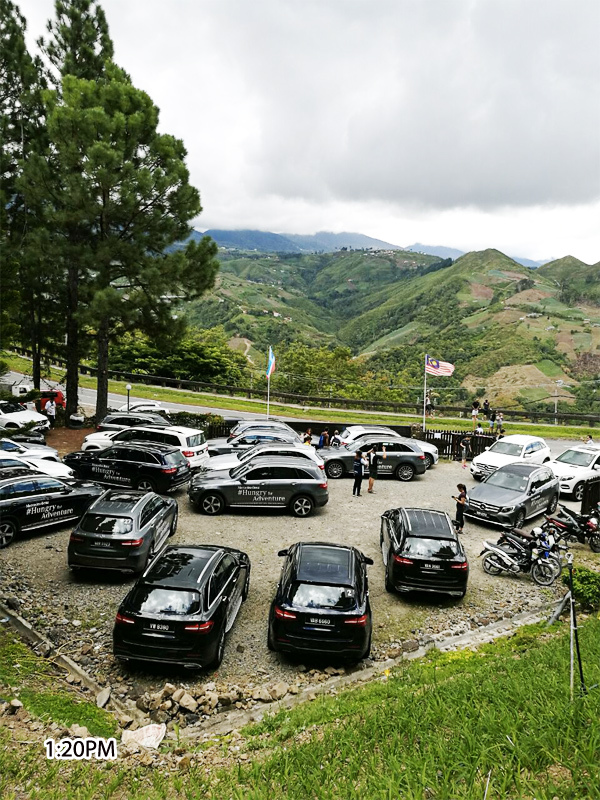 In terms of growth, it will be the SUVs and the GLC is the best selling in Malaysia and we sold over 3,000 units since its launch. 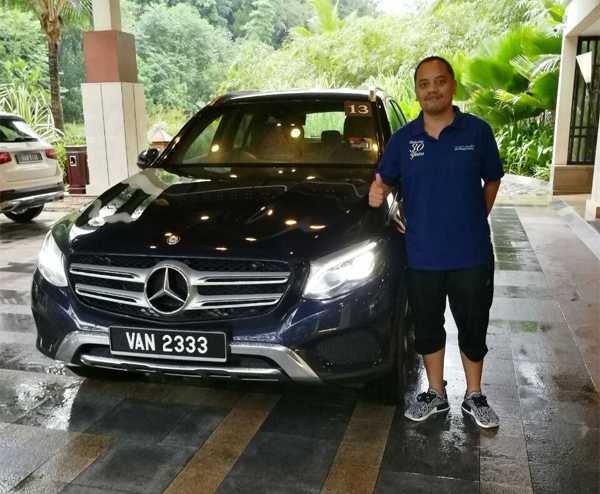 Rano Iskandar: Why introducing the GLC 200 if you already have the GLC 250? Mark Raine: We have the GLC 250 which is a brilliant product. It’s an SUV 4WD and offers great speed and comfort, positioning it as a very sporty, luxury model. 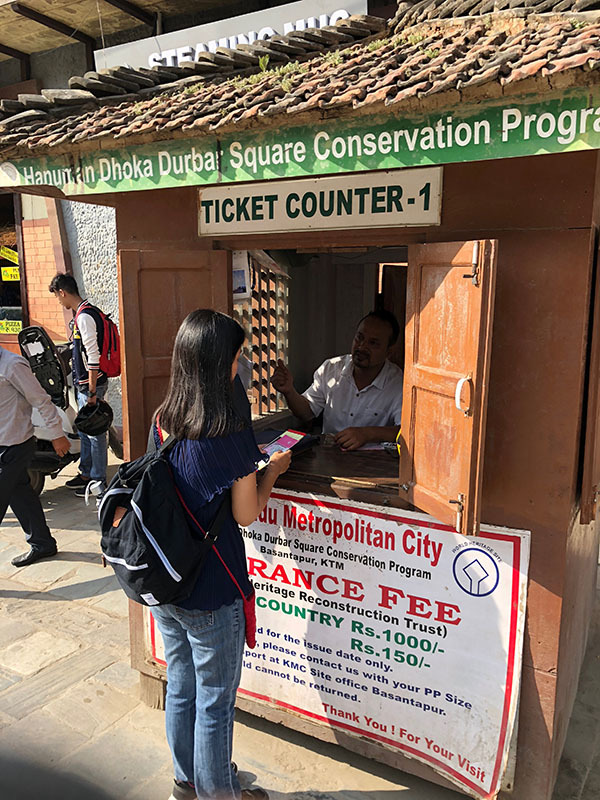 However to a certain extent, we are only capturing a lot of market but there are customers who want different qualities and traits and their mindsets are different from other customers. 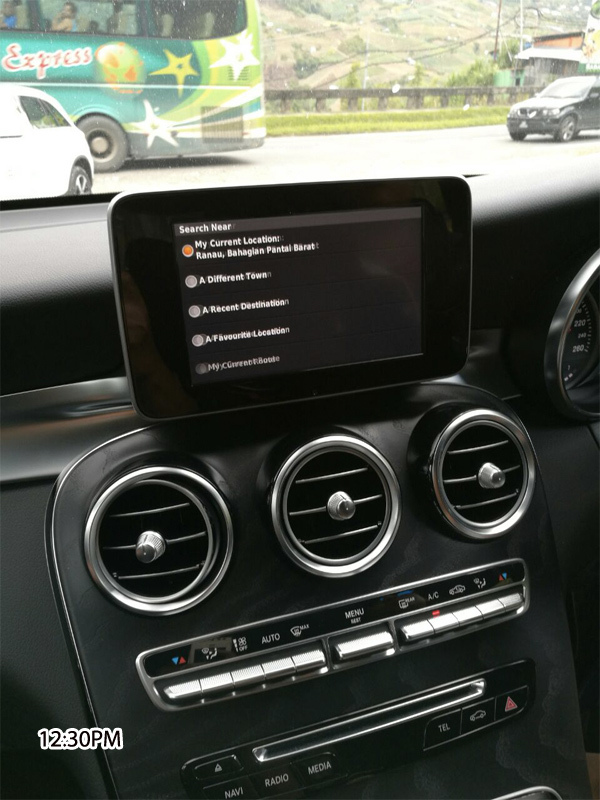 Hence the GLC 200 repositions itself in more exclusive luxury segment. It comes standard in on-road package or off-road package. The interior package also makes the value perception of this vehicle very, very high. The GLC 200 is just a notch below the GLC 250, hence makes it more affordable for most customers in the market. The unique selling point of the GLC 200 will be the exclusive luxurious appeal with high value perception and many features at a very competitive price. 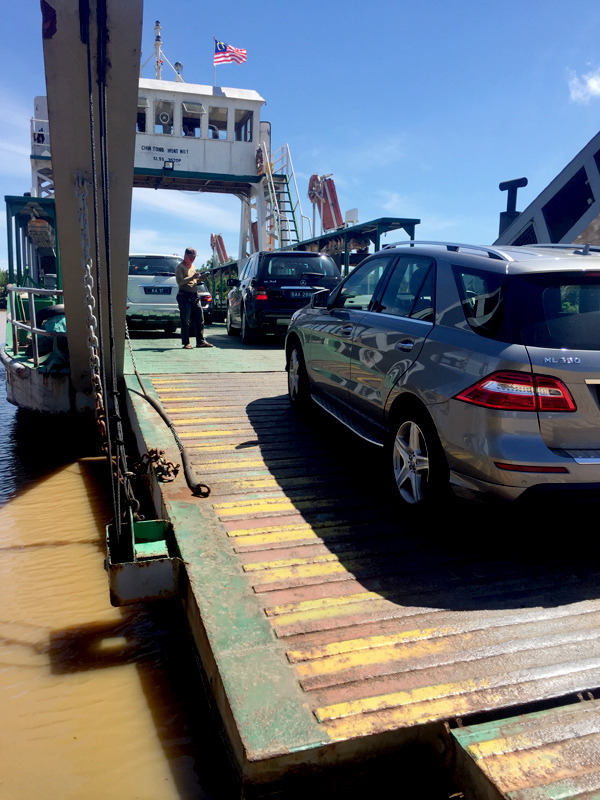 Rano Iskandar: The GLC 200 is locally assembled in Malaysia. 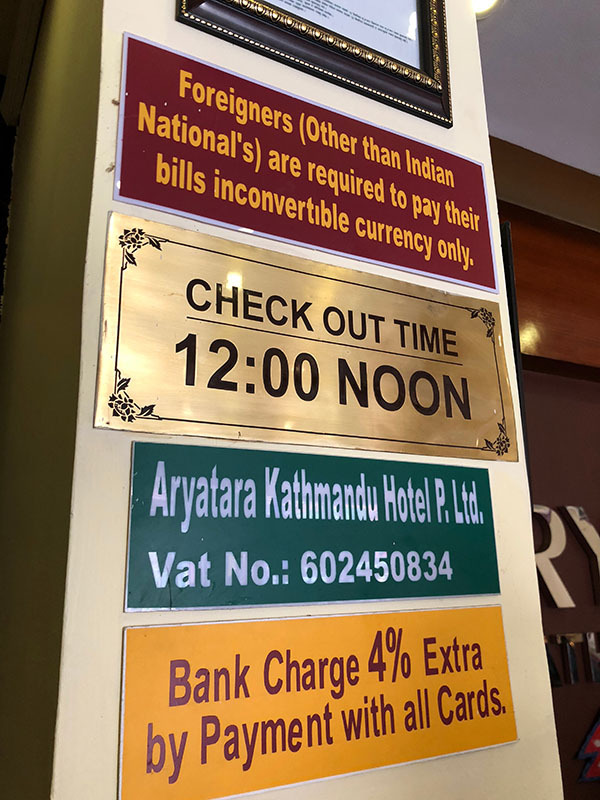 Is there any difference from the ones being imported? 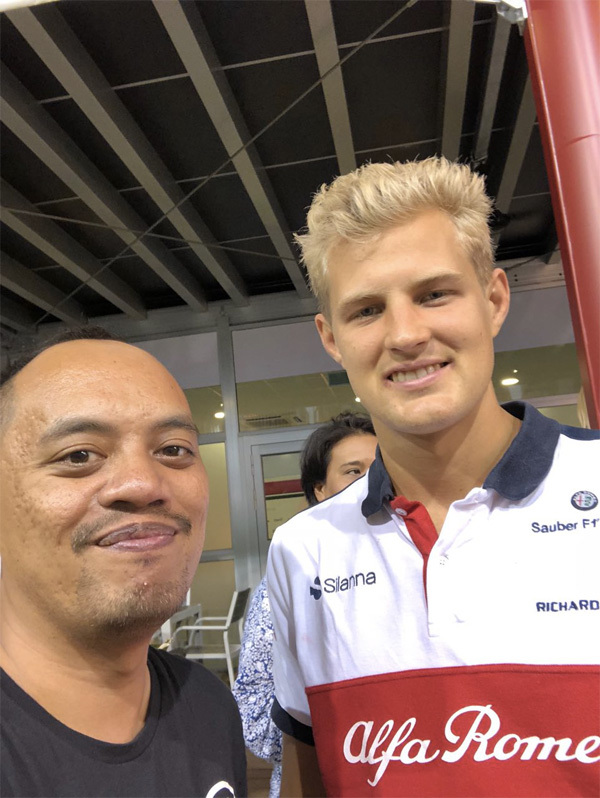 Mark Raine: No difference at all. Same car, same quality, same quality checks. In essence, the same car. 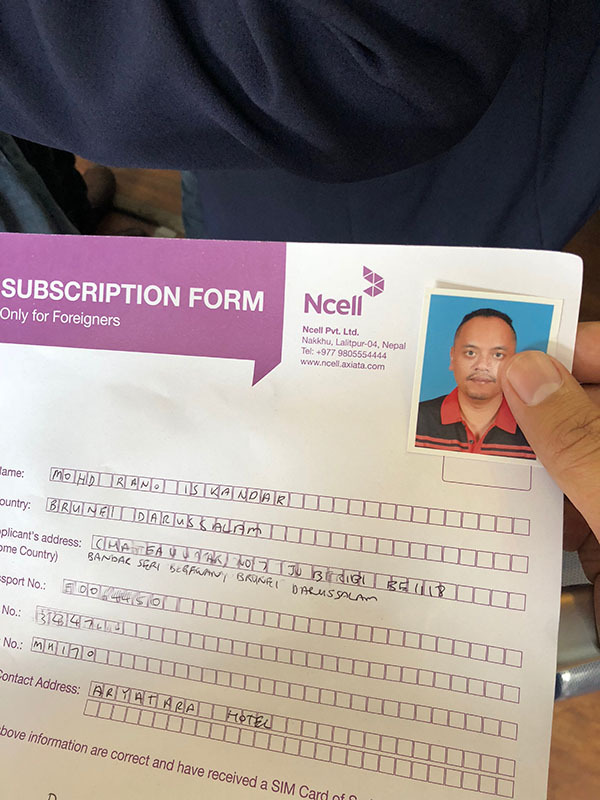 In South East Asia, we have a local production because we have tax exemptions and it makes the pricing more attractive. 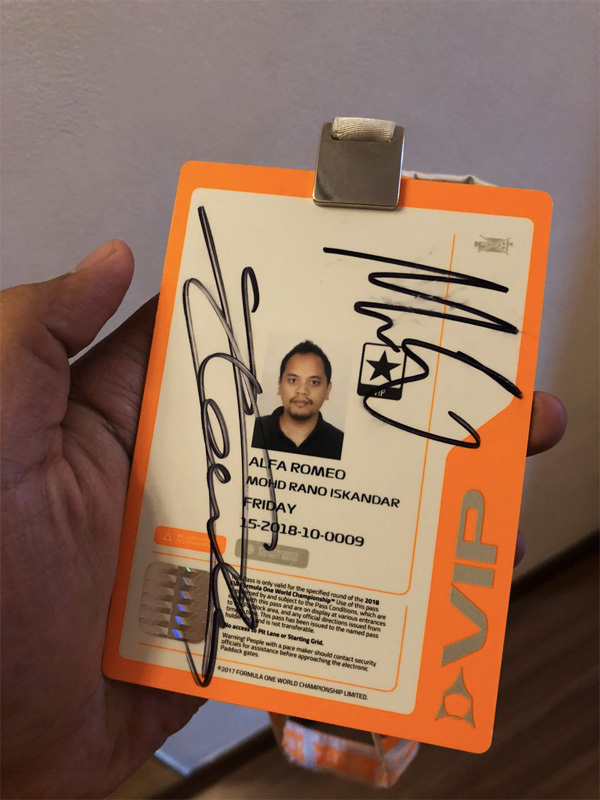 Rano Iskandar: The GLE 43 Coupe OrangeArt Limited Edition. 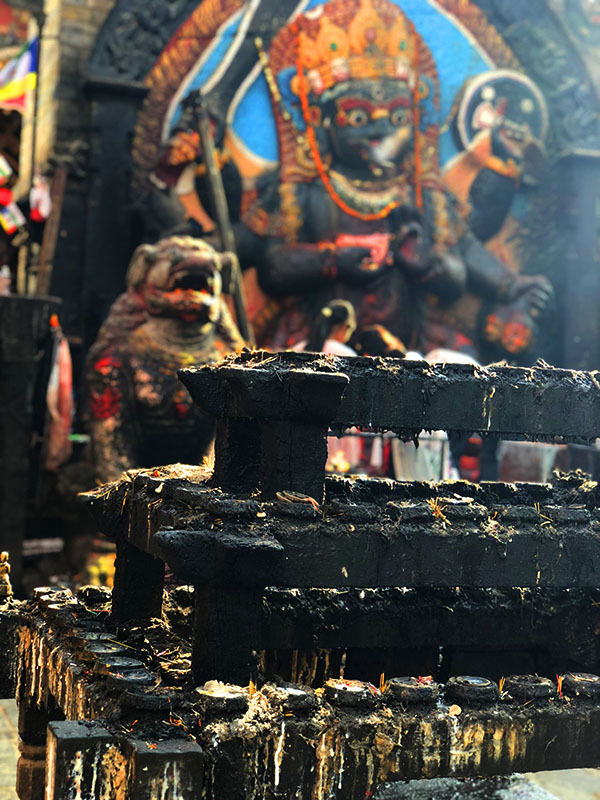 Share me more about it. 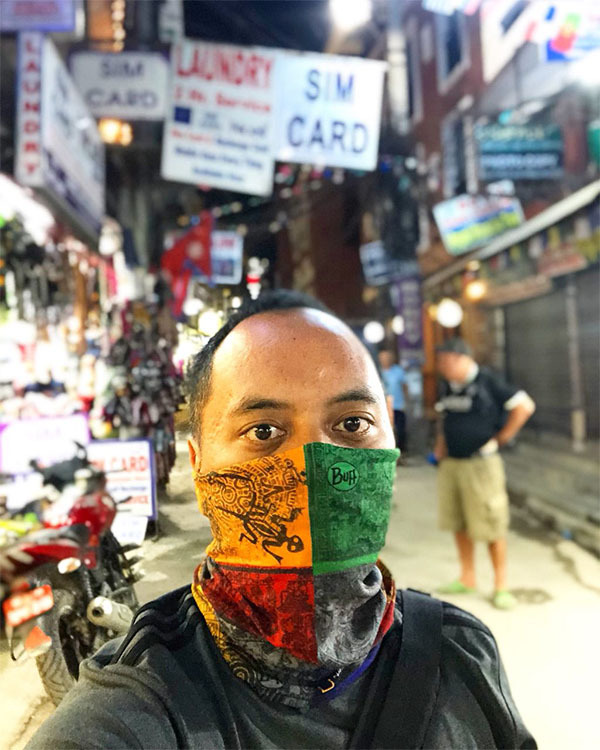 Mark Raine: It’s already available through order. It’s very limited and exclusive order. 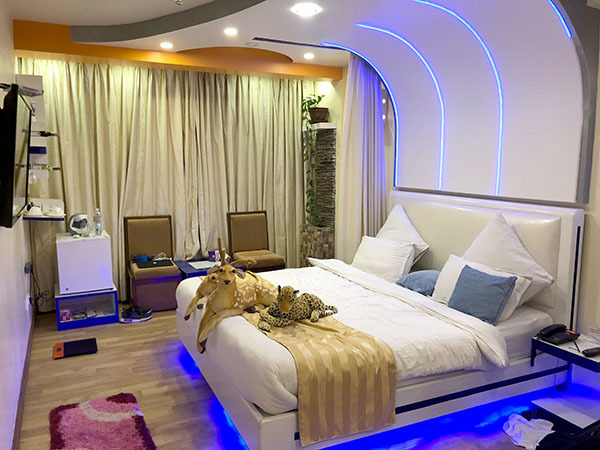 It’s very eccentric and flashy feel. It has a 21 inch AMG wheels with the OrangeArt Edition exterior package. 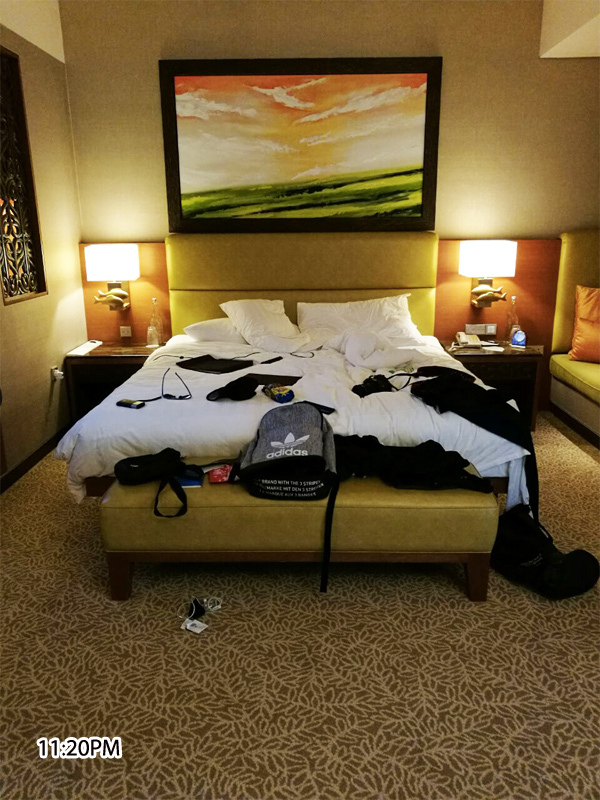 We even have the Night Package. 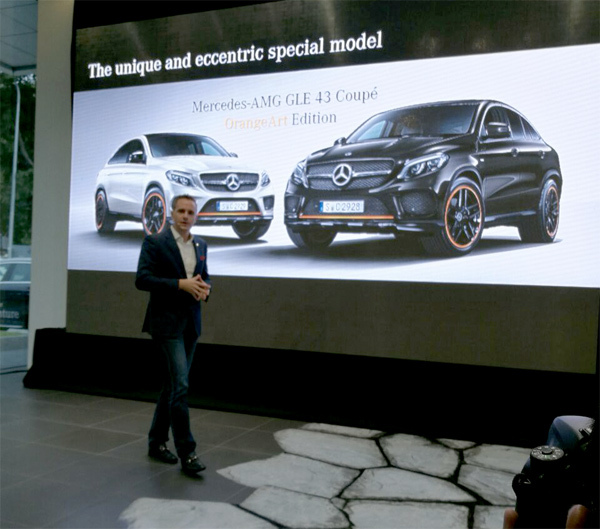 The eccentric and unique edition features extravagant design highlights including striking expressive decals in the orange on the front apron and the AMG wheels painted in high-gloss black and rim flange painted in orange. The GLE 43 Coupe Orange Art Edition making it a high end personalised edition giving that special, individualized character and it’s definitely a striking appeal. Day 2 – Group shot with the representatives from Singapore, Malaysia, Cambodia, Loas, the Philippines and Brunei. This was taken at entrance at the Ocean Wing, Shangrila’s Rasa Ria resort at Tuaran, Sabah. 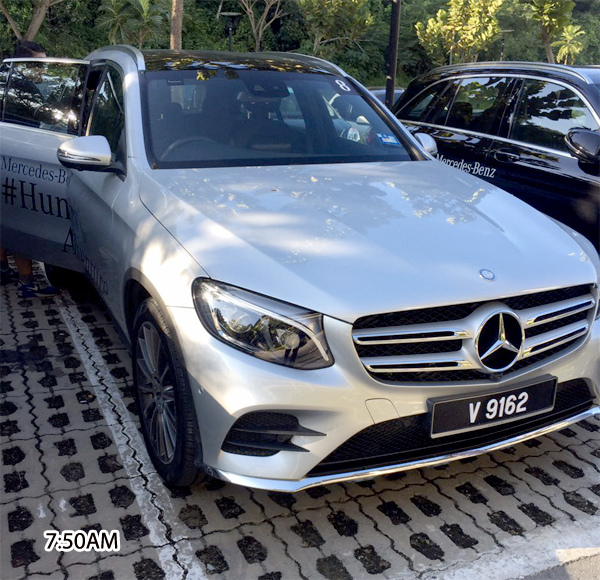 This was our car for the day – the Mercedes-Benz GLC AMG 250. 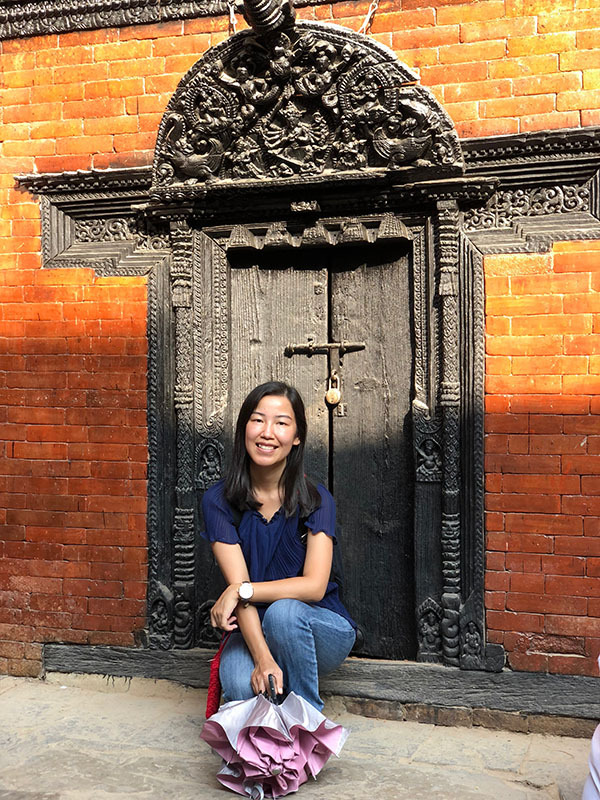 So much to love about this model and it’s one of the most popular model in South East Asia. One of the media had the opportunity to hug a tree. I should have done that. 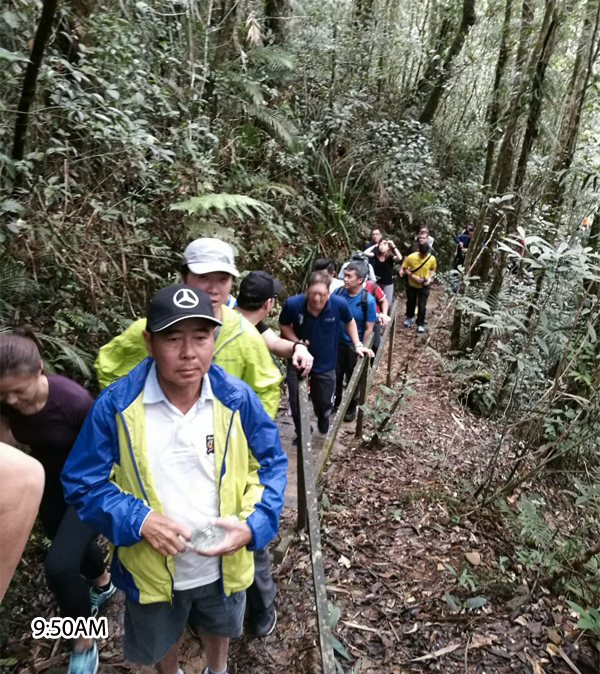 This was the 2nd round of trekking which was tougher than the first one. 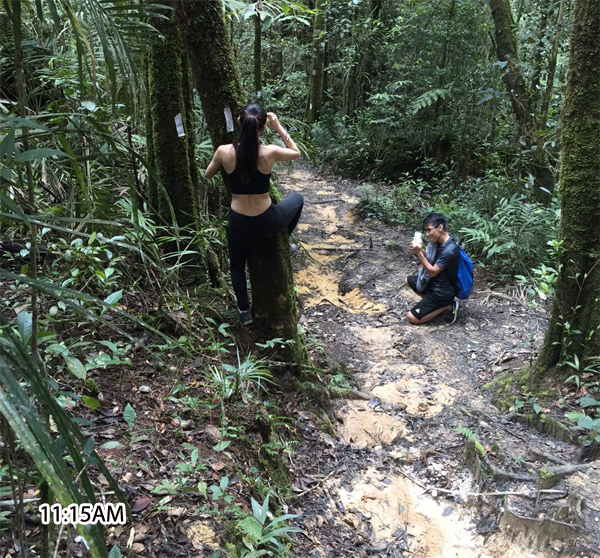 I survived but my sneakers were all dirty from the soft ground. 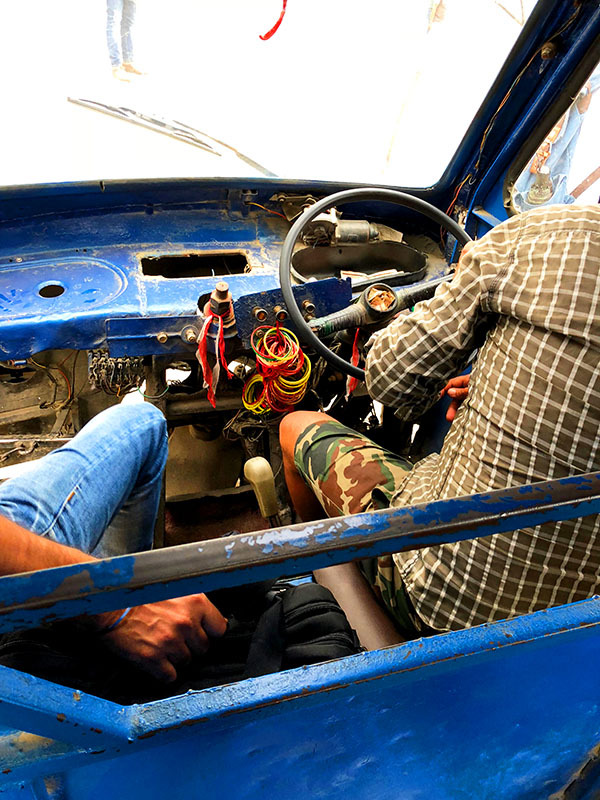 We finally worked out the navigation for easier reference while driving. 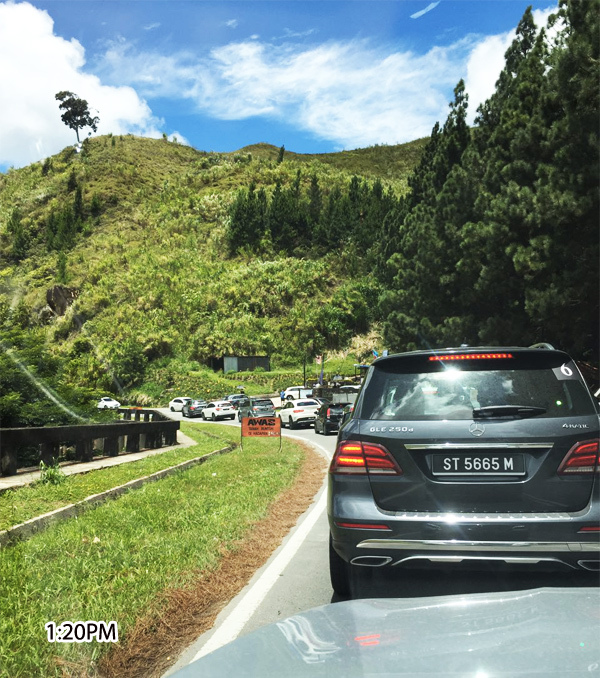 Hence we realised less on waze unless we want traffic update. Group photo with representatives from Brunei Darussalam. We all had a good time. A shot with the mountain view. 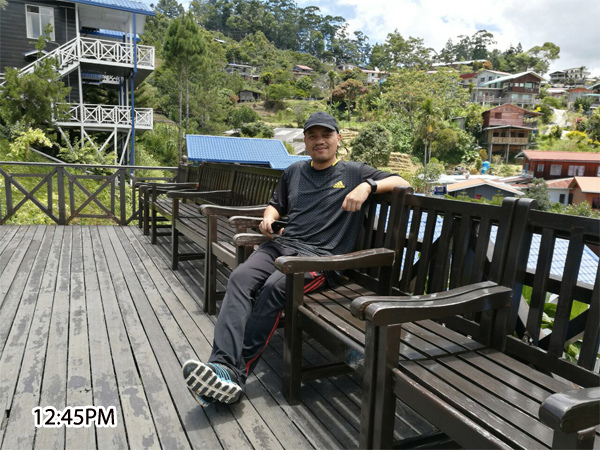 I love the background scenery. 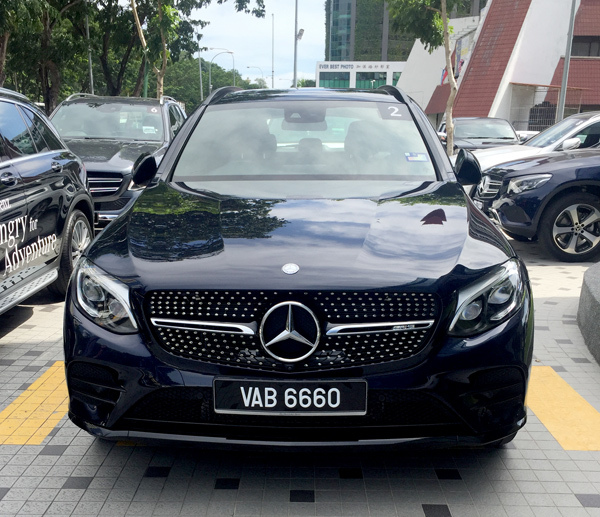 After trying out the GLC AMG 43 and the GLC AMG 250, I test drove the tamer version which will be launched in Brunei in November – The GLC 200. Again, a luxurious model of its own. I tested with the Sport+ and Eco mode and you can tell the difference. I even did the launch control on the long stretch at Shangri-La’s Rasa Ria. Love that adrenalin feeling. 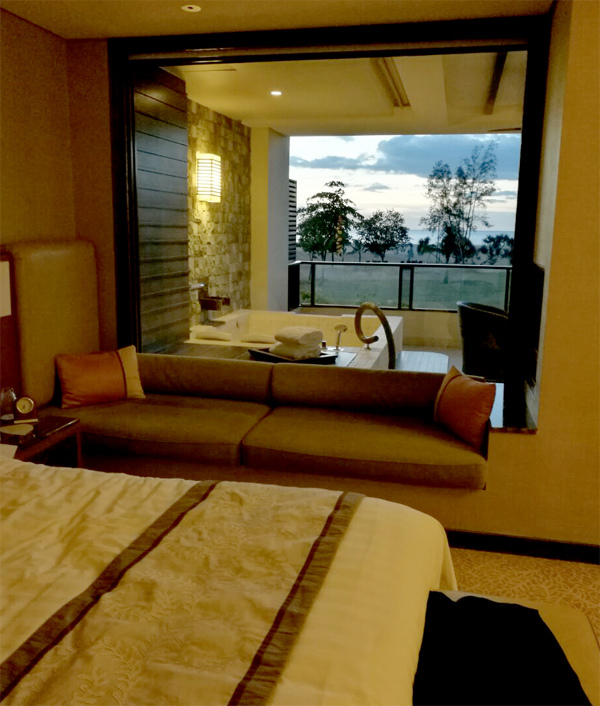 Apart from the test drive, I love the fact that our host accommodate the invitees to stay over at Shangri-La’s Rasa Ria Resot and I truly loved the experience. 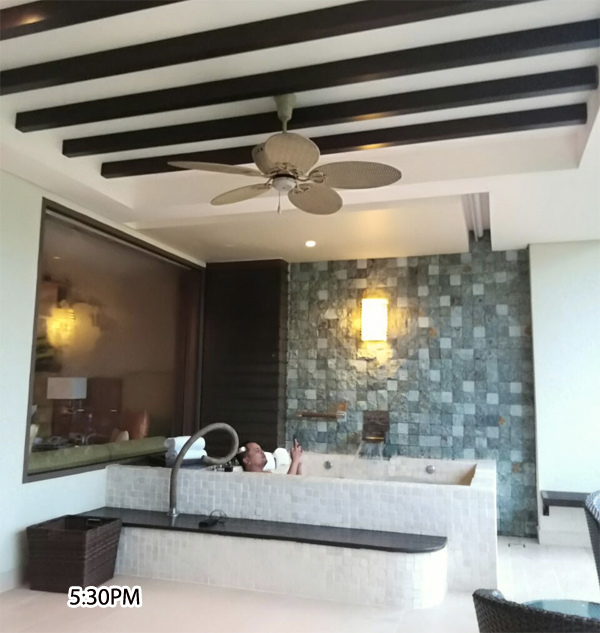 I made use of the humungous bath tub outside my room. The finale BBQ dinner to cap off the #ReadyForAdventure trip. 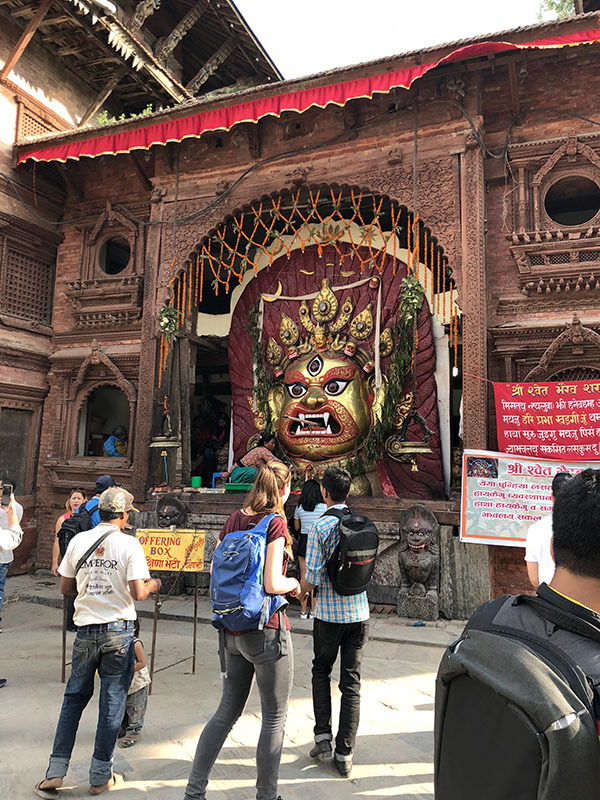 Thanks once again! 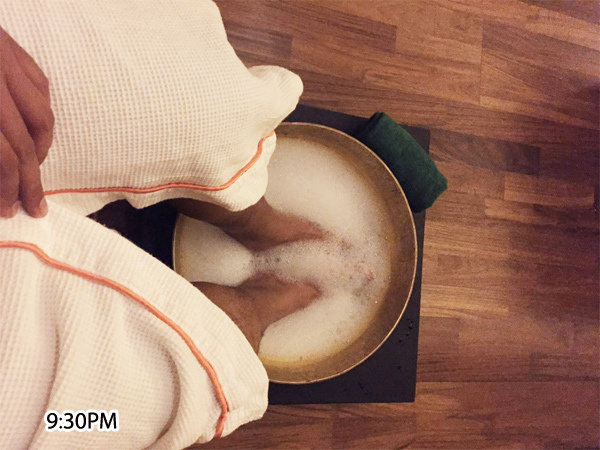 I wanted to pamper myself and indulged for a massage session at the hotel. I shall give this 4 stars for the overall experience. I even fell asleep at one stage. So good. 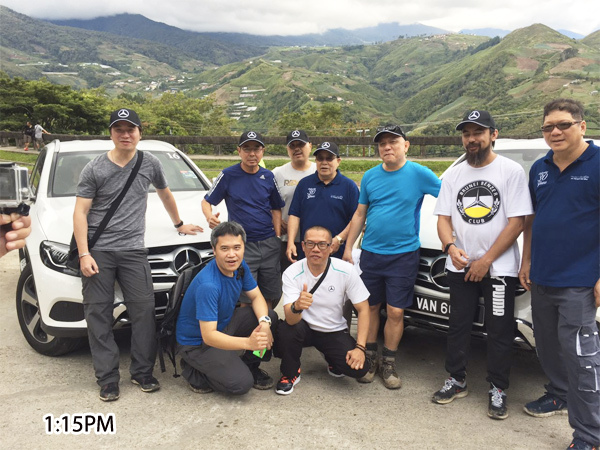 Kenny Ng, General Manager of Emerging Markets, Daimler South East Asia and Ho Ley Hoon, Sales Manager of Jati Transport Sdn Bhd with selected owners of Mercedes-Benz SUVs before heading off on a road trip to Kota Kinabalu. 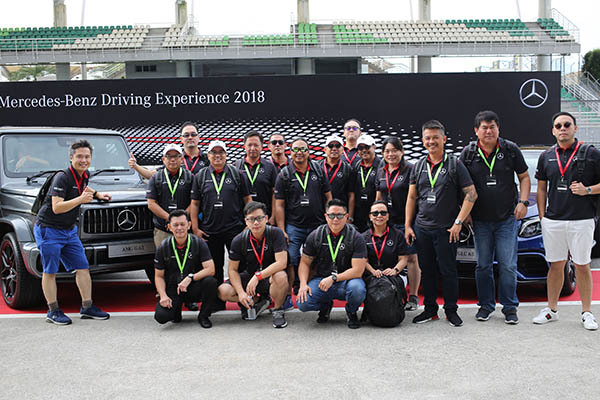 Jati Transport Sdn Bhd invited selected SUV owners of Mercedes-Benz and two members of the media for Mercedes-Benz SUV Endurance Road Trip to Kota Kinabalu, Sabah. 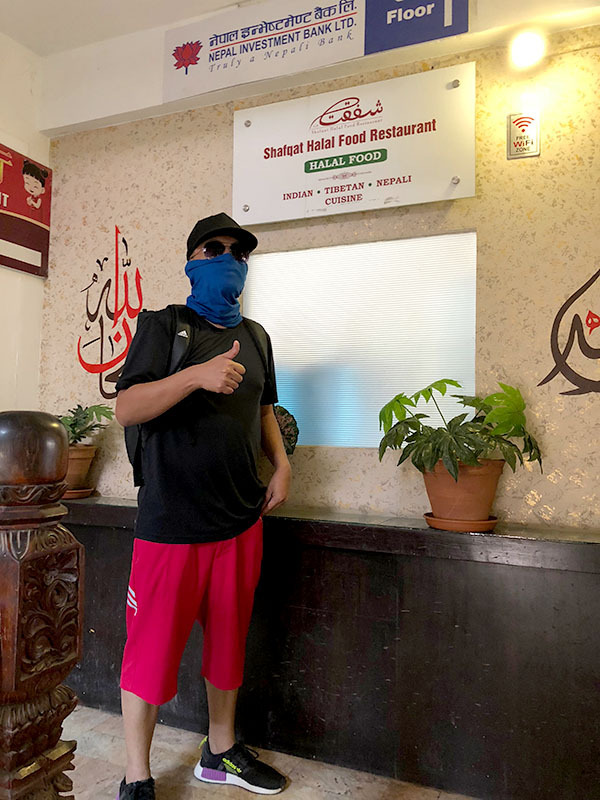 This was considered my fifth overseas assignment for automative in the past few years and this time it’s a road trip from Brunei to Kota Kinabalu. 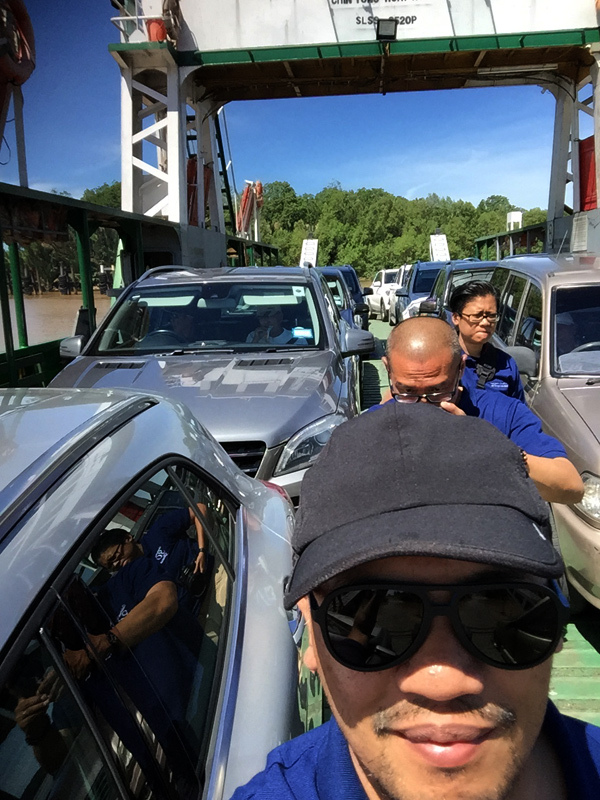 Yes, I’ve been on the road once but only from KK to Brunei and not back and forth. 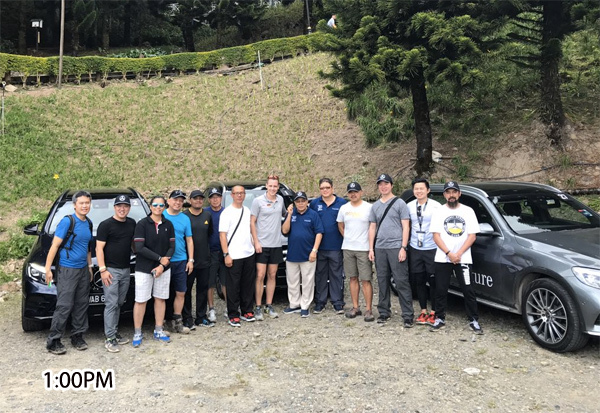 It’s an honour to have Jati Transport organizing the Mercedes-Benz SUV Endurance trip and also inviting me to be part of the media team. Thank you, thank you. 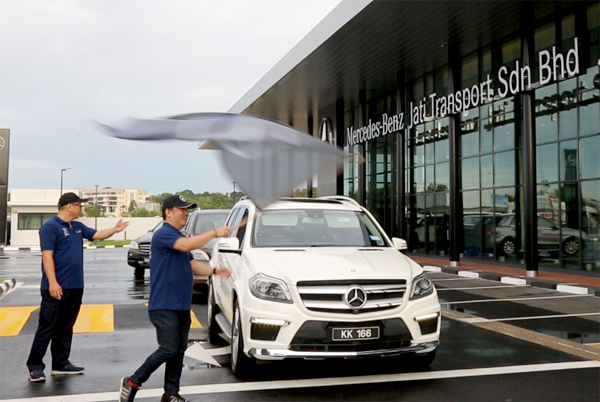 The flag off took place at 7am yesterday at the new Mercedes-Benz Autohaus at Beribi. 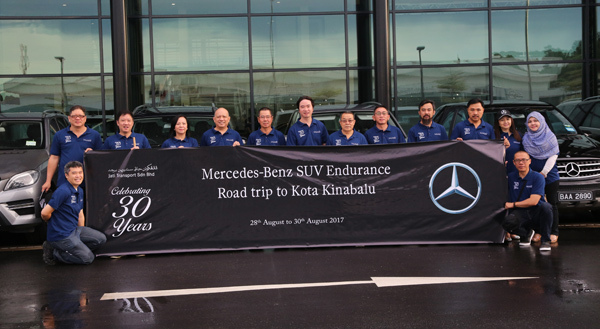 There were a convey of 8 Mercedes-Benz and they were flagged off by Kenny Ng, General Manager of Emerging Markets, Daimler South East Asia and Ho Ley Hoon, Sales Manager of Jati Transport Sdn Bhd before the entourage departed to Kota Kinabalu. 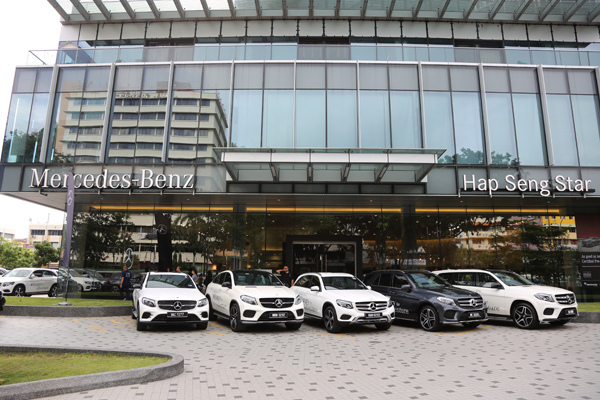 The trip took roughly six and a half hours before arriving at Hap Seng Star showroom (Mercedes-Benz KK). 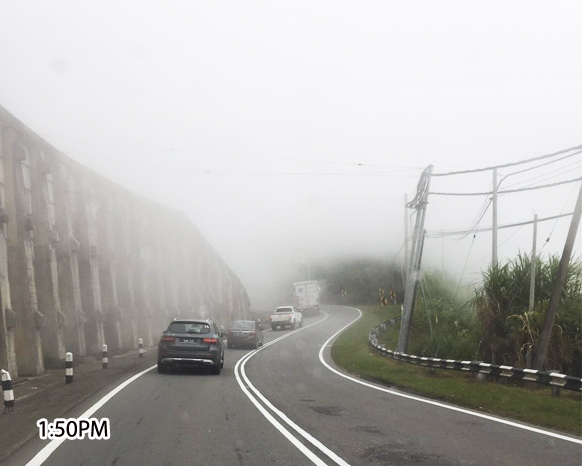 The entourage is expected to drive back from Kota Kinabalu tomorrow lunch time. 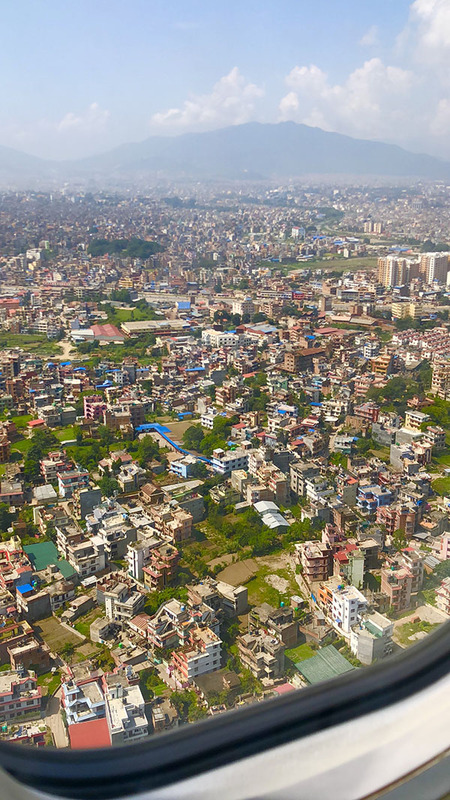 Some parts were affected by the flood. What was being showcase? 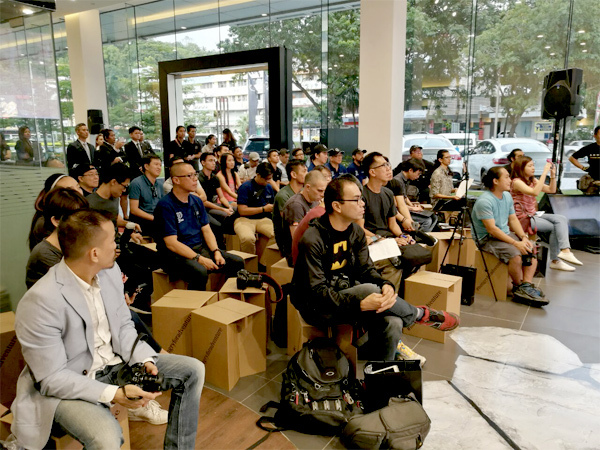 The media from Brunei Darussalam, Malaysia and Cambodia and selected Mercedes-Benz owners from Brunei Darussalam were invited for the exclusive launch of the Mercedes-Benz GLC 200 at Hap Seng Star showroom at Kota Kinabalu. 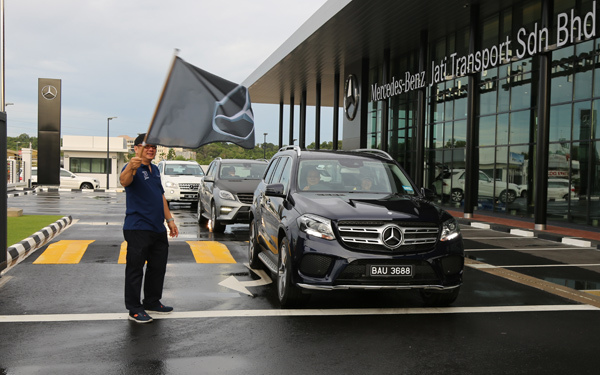 The Mercedes-Benz GLC 200 was unveiled by Mercedes-Benz Malaysia sales and marketing, passenger cars vice president, Mark Raine, who flew in from Kuala Lumpur for the 3 day event. 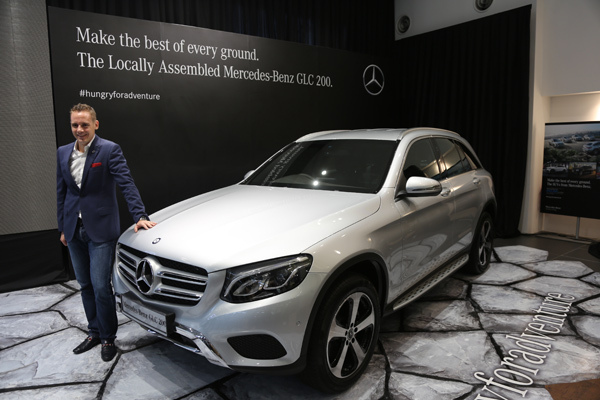 Another edition has been added to the Mecedes-Benz SUV family – the GLC 200. This is to cater to the unique lifestyle and demands of its customers with the launch of the new GLC variant: the GLC 200. 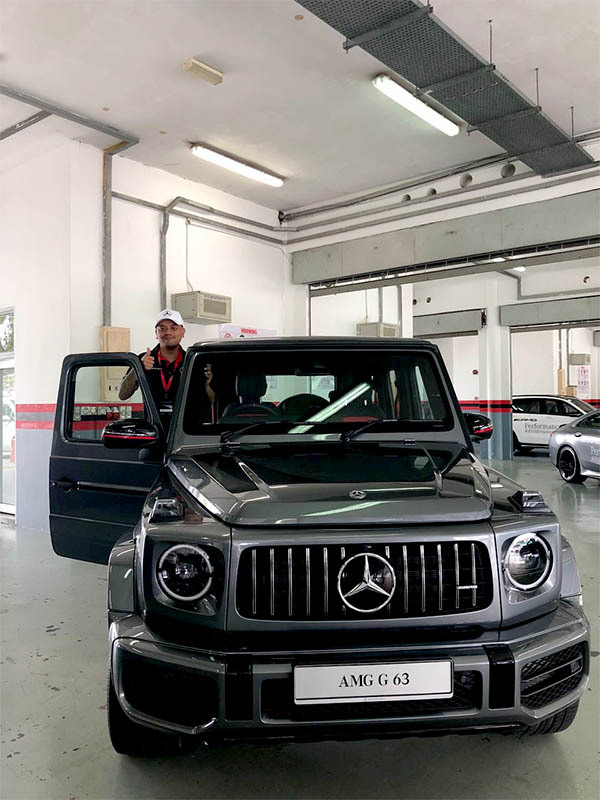 It is equipped with numerous high-end features including the 9G-TRONIC automatic transmission, an Off-road exterior package, 19 inch 5-spoke allow wheels and LED High Performance headlamps. The interior has a luxurious appeal with a high value perception. 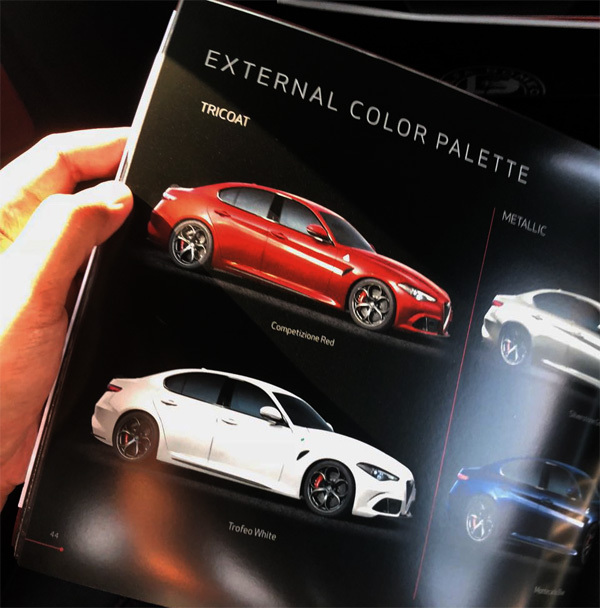 The interior colors ranging from black, espresso brown to silk beige in combination with the exclusive brown open-pore ash wood trim and the ARTICO man-made leather dashboard underline the exclusive appearance of the premium SUV. 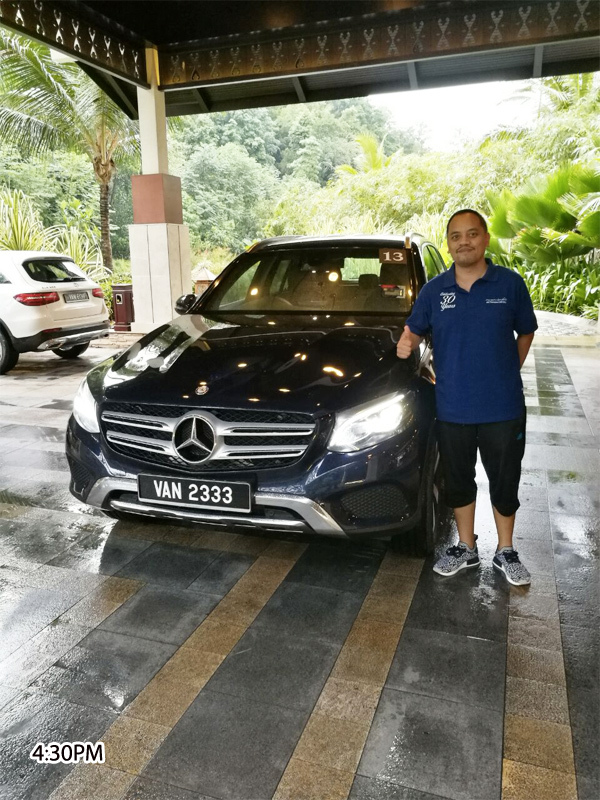 Malaysians had the privileged of the locally-assembled GLC 250 4MATIC and now they have brought it a new variant to underline its claim as the leader in the premium SUV segment in Malaysia and this also provide a wider avenue for their customers to choose from. The GLC 200 is powered by a 2.0 liter 4 in-line engine, which produces an output of 135kW (184hp) and 300 Nm of torque. The nee-stage 9G-TRONIC automatic transmission also comes as standard on the GLC 200. Depending on the mode selected for the DYNAMIC SELECT dynamic handling control, the automatic transmission with a torque converter boasts great agility and responsiveness. Its interior features Exclusive line, including upholstery in ARTICO man-made leather/fabric, ARTICO-covered dashboard with contrasting topstitching in three colors, seats featuring an exclusively upholstery layout, wood trim in high-gloss brown line structure lime and the 3-spoke multifunction steering wheel. Hap Seng Star showroom at Kota Kinabalu. Nice, nice!! Now this OrangeArt Edition caught my eye. 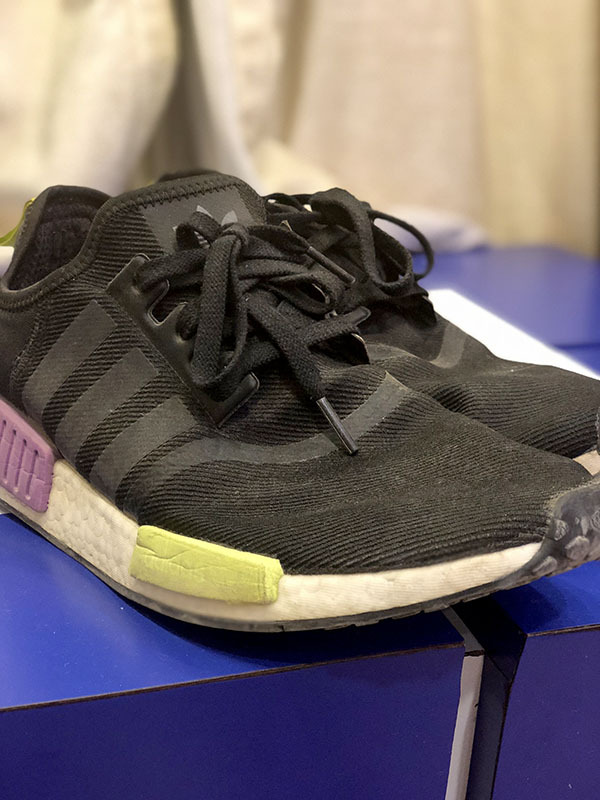 Very limited too.